I’m not a planner. The sole plan I have in life is to have no plan. Planning has a way of, well, getting in the way – we’re so fixed on goals and objectives that we don’t see the opportunities that present themselves because they don’t fit. This applies to everything from people to places, from travel to travail. Road trips are made for me. I like the freedom to be able to detour, yet it’s always good for me to have a slight focus, too. Even if it’s only one place. The rest can fall in around it. 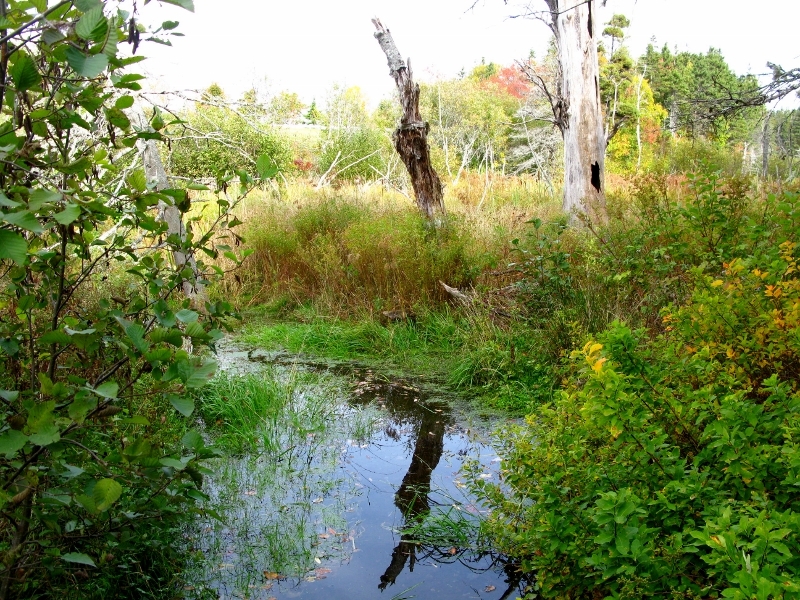 Off the Confederation Bridge from PEI, we landed in a swamp. 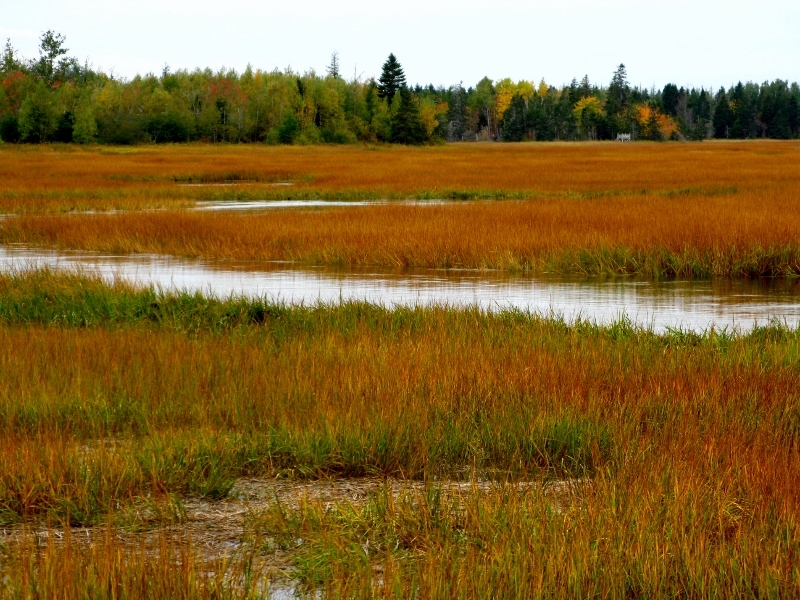 New Brunswick (the source of a third of the world’s French fries) is marshy land – lots of water and lots of grass. 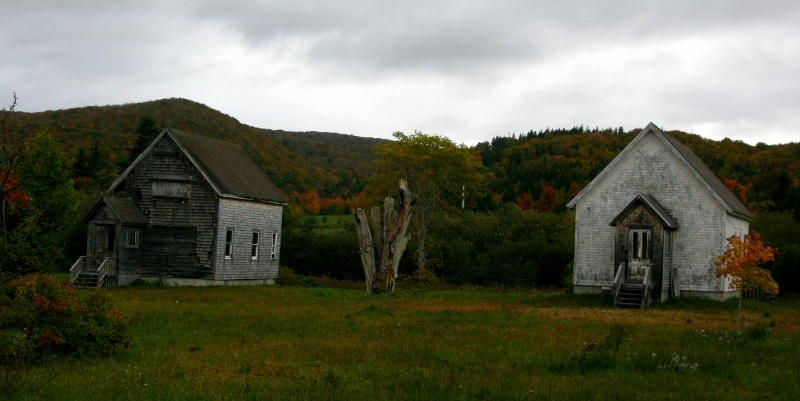 We drove the back roads to loop into Nova Scotia on a premeditated quest to visit the Thinkers’ Lodge in Pugwash, home of the 1995 Nobel Peace Prize. In 1957, at the height of the Cold War, the first Pugwash Conference on Science and World Affairs took place in this serene setting. Hosted by philanthropist Cyrus Eaton, top-level scientists from both sides of the Iron Curtain met to discuss the threat of nuclear weapons and the responsibility of scientists to work for their eradication. This courageous and groundbreaking meeting launched the Pugwash Movement, an influential transnational organization for nuclear disarmament. A place of inspiration and reflection, Thinkers’ Lodge remains a symbol for the Pugwash Movement and a beacon for world peace. But it was closed. And it was miles out of our way. I had grand notions of sitting in the same chair as some of the finest minds known to man in the hope that some of their braininess might seep into me by osmosis. Instead, like a bad burglar casing a joint in broad daylight, I just got to peep in the windows. En route, however, the countryside was beautiful even if the towns and villages we passed through were a tad strange. The province is home to about three-quarters of a million people and we may have seen three. 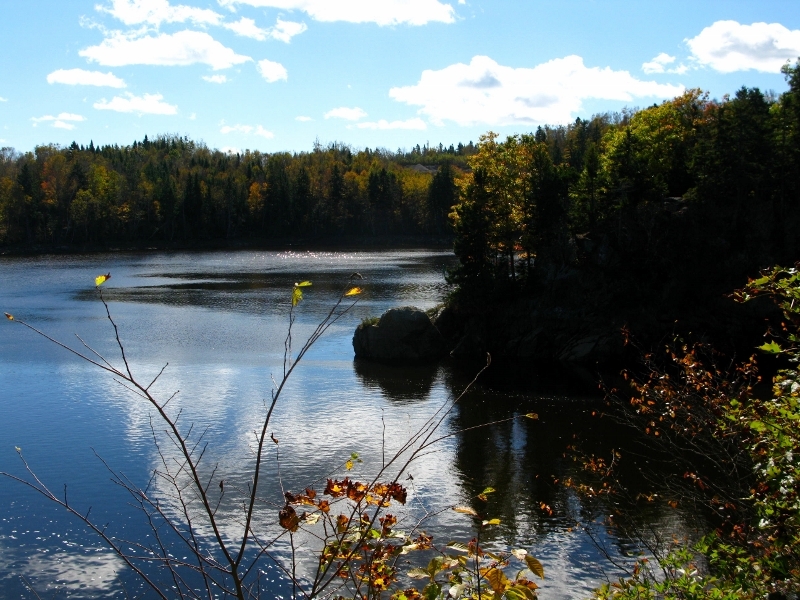 It’s Canada’s only official bilingual province with 33% of the people speaking French. And it has lots of dead people. I can’t think of anywhere I’ve been where I’ve seen so many cemeteries, most of them unfenced on the edge of the road. For someone who regularly communes with the dead, I found this very interesting if not a tad strange. 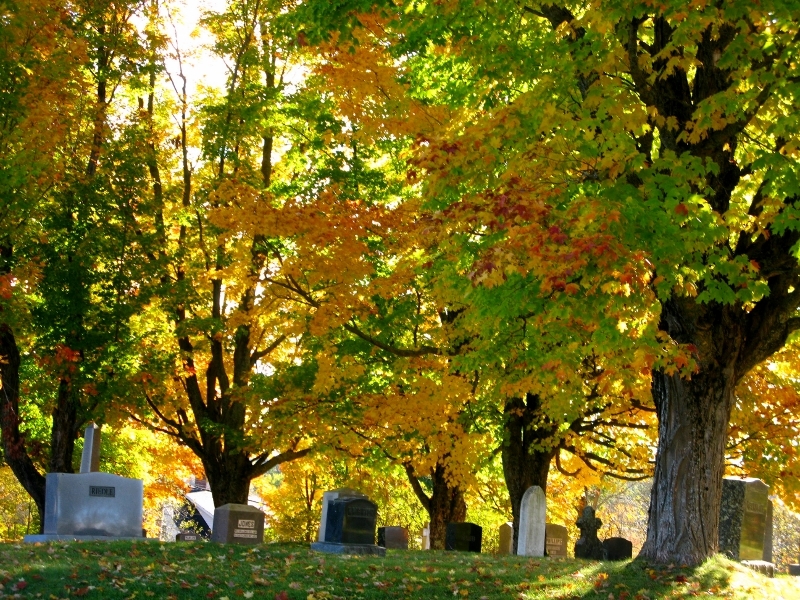 I can’t think where the dead might wander to, but I prefer to have a clear division between their houses and mine. We overnighted in Moncton and tired enough after a day in PEI and a less than fruitful trip to Pugwash, were happy enough to dine locally and hit the hay. Next morning though, we set off on a day that can only be marked as peculiar. 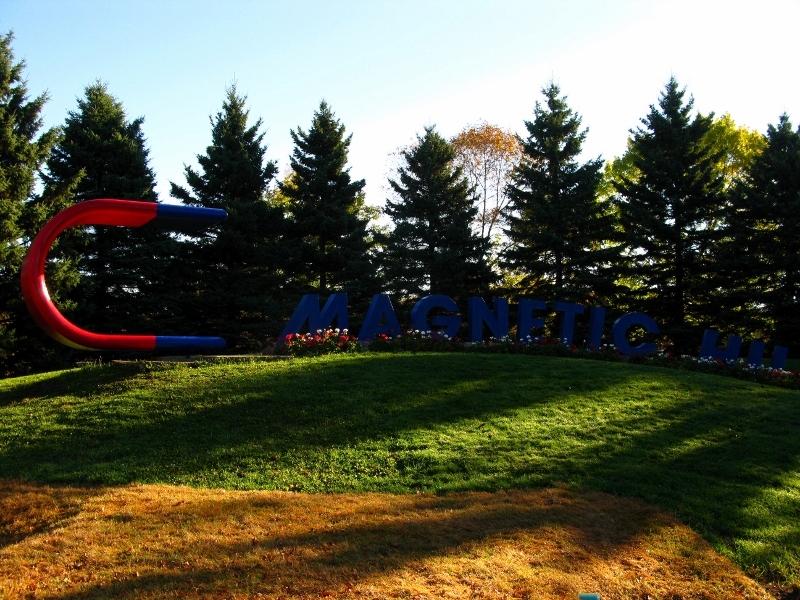 First up was Magnetic Hill, an optical illusion that makes you think your car is being pulled uphill while in neutral by some magnetic force or other. I don’t quite get the science but it’s impressive. The instructions are clear – drive to the bottom of a hill, turn around at the white post, put your car in neutral, and steer as it is pulled up the hill. I was there and I’d swear on a stack of spare tyres that I was climbing a hill but apparently, I was going down one. Most peculiar. From there it was on to the US border via a series of saintly towns – St George, St John, St Andrews – and ne’er a sign of a St Mary, St Ann, or St Margaret. Not impressed, lads. 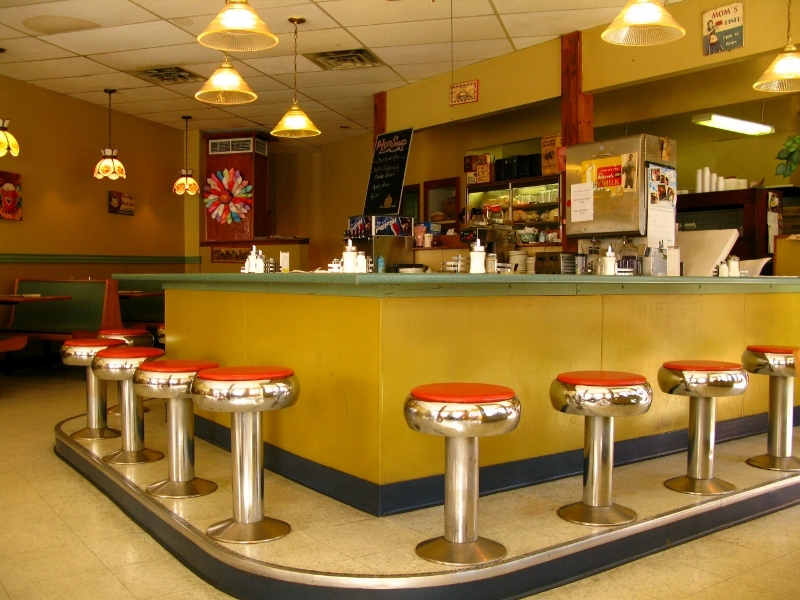 We stopped in St John at what is a North American institution – a diner. I love these places with a passion I usually reserve for lángos. They’re at the hub of so many local communities where, in their faux leather booths, the world is repeatedly set to rights alongside healthy doses of gossip and friendly interference. 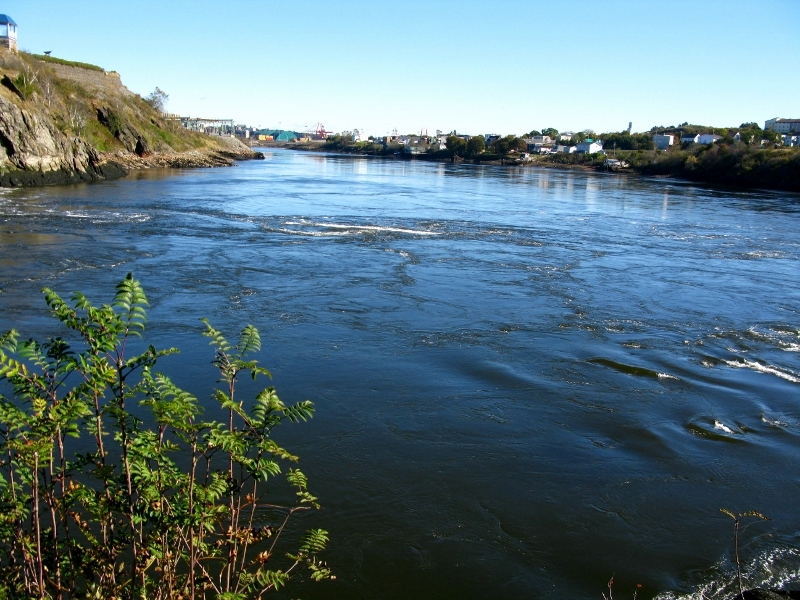 It was in St John’s that we came across the Reversing Falls – another peculiar phenomenon native to New Brunswick. Water flows from under the bridge to the right and does a U-turn and flows back to the left. Amazing to watch. Again, I don’t get the explanation – or rather, I’m not interested enough in the detail to devote any brain power to trying to understand it. It was enough to see it happen. Perhaps that’s one of the side-effects of being raised Catholic – not everything needs an explanation. Next up in the series of saintly towns, laid out like knots on a piece of convoluted string, was St George, a curious place that was in the middle of commemorating its fallen heroes. 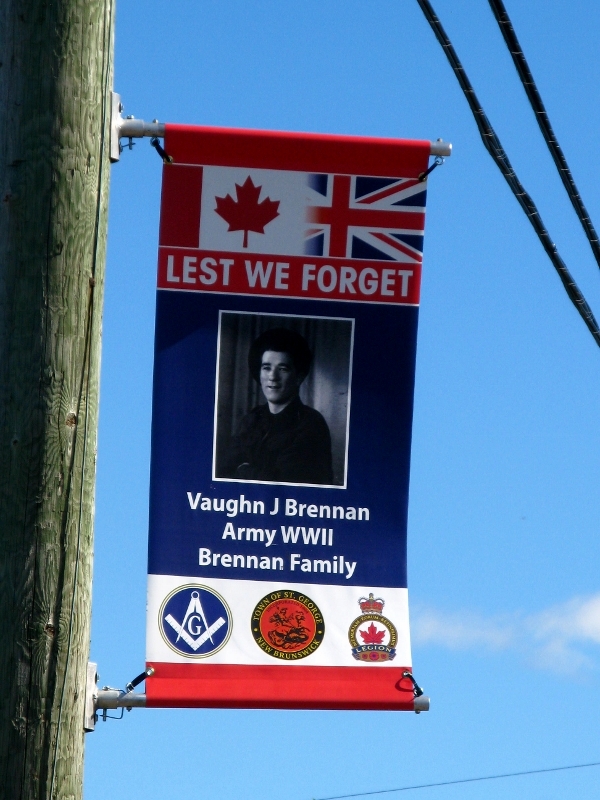 The streets were lined with banners depicting photos of veterans and the place had a slightly funereal sense to it until I got used to them. The more I saw of them, the more I liked the idea. Back in its day, St George had a lot going on, and was perhaps most famous for its granite. Today it would seem that it depends a lot on tourism but obviously in season; we were on our own that day. St Andrews was next. Quaint, on the verge of being twee but thankfully not making it, and very liveable, if you don’t mind tourists on your doorstep every day. It’s a town that doesn’t seem to take itself too seriously and is in no rush to go anywhere. It must have taken 20 minutes to get two cups of filtered coffee – no exaggeration. [And while I’m on the subject, Canada doesn’t do coffee… I don’t think I had a decent cup all the time I was there – wine over.] Probably best known as the home of the Algonquin Resort and its Room 473, said to be haunted by a jilted bride who died there in the early 1900s, the town has more churches than any I’ve seen. I counted five (all different religions) in the space a minute – and these were the ones we drove by, not the spires we could see in the distance. From there it was a clear sailing to the border. It was Sunday, the day before Canadian Thanksgiving and far from the queues I’d expected, we were third in line. Forced to do a rather suspicious turnaround on approach (thanks to my forgetfulness, chronic sense of direction, and complete lack of spatial judgement) we returned ten minutes later to queue. It was a slow day for the boys and we must have presented them with some diversion. Hauled in, nicely questioned, and duly stamped, we just lost 30 minutes and $6 to the wheels of US bureaucracy. Three provinces in five days and some gobsmackingly gorgeous scenery. Thank you, Canada. It’s been a pleasure. Particularly Nova Scotia. 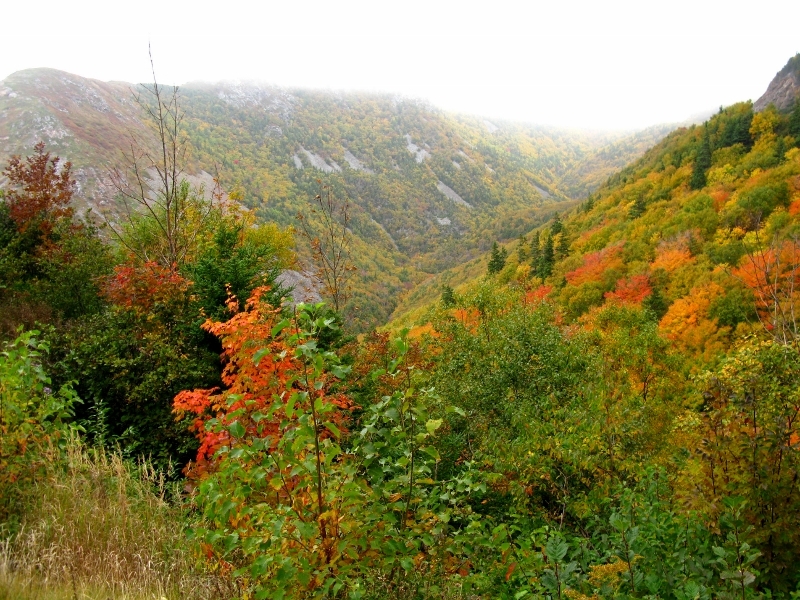 The tourist slogan for Cape Breton Island has it nailed – once you visit, your heart will never leave. Put a bunch of Irish, American Loyalists, and Scottish Highlanders on an island and a couple of centuries later, you can have your own Heritage Village celebrating the fact that they all got on so well and lived and prospered. Who’d have thought it? Orwell Corner on PEI (Prince Edward Island) was closed for the season (nothing new there) but we shamelessly drove in anyway and had a look around. It’s all quite nicely done and had it been open, we might even have been tempted to pay to have a proper look-see. As it was, we were grateful that there was something to see at all. We got a tad excited at the thoughts of visiting a Belfast that didn’t have black cabs and murals on the wall, but when we drove through it (twice) without realising, we reined in our expectations. PEI certainly isn’t Nova Scotia. 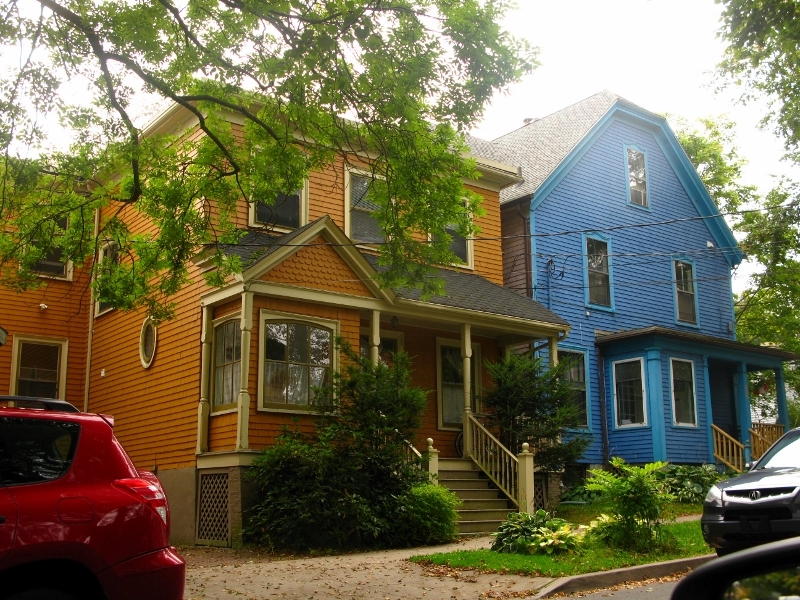 That said, its capital Charlottetown, a city that bills itself as a walkable one, is rather sweet. We slept well, ate well, and managed to see something of the place before moving more north in search of Anne Shirley and the lovely Gilbert Blythe. 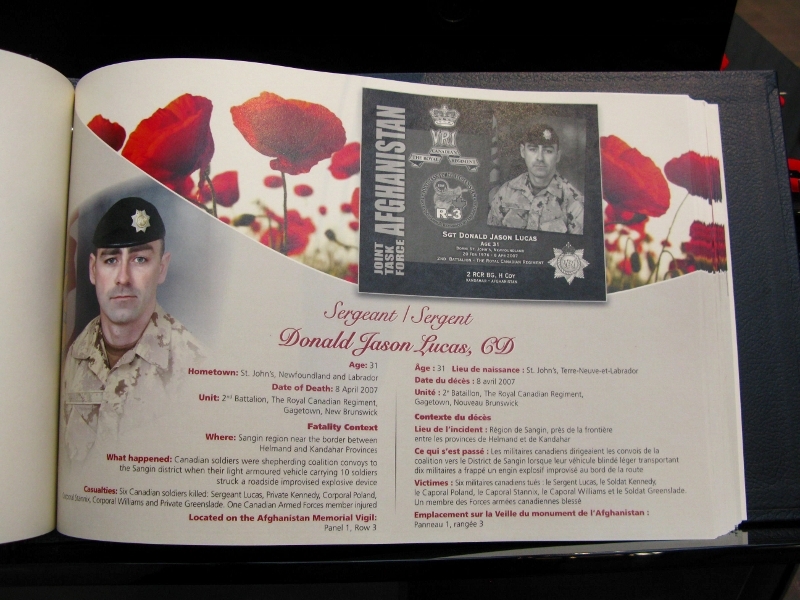 While in Charlottetown, I went to see a memorial exhibition for Canadian soldiers killed in Afghanistan. I had a long chat with Sargent P, a short, stocky man with military bearing whose punctuated speech sounded remarkably like a machine gun in semi-auto mode. He’d been home on leave on Easter Sunday 2007 when he saw on the news that six of his mates had been blown up. He’d wanted to stay in Canada to meet their bodies and pay his respects but he had to go back. They crossed in the air. Seven years later, he was still remembering. I asked him why he’d signed up. Why the military? He said that he didn’t have what it took to be a policeman, but he had two kids. I didn’t get the connection and said as much. I got that look – one I’ve had many times before – the one that says if you don’t have kids, you won’t understand. Quite simply, he wanted his kids to be proud of him. I was struck by the honest-to-goodness, down-to-earth simplicity of his thought. Why do we make life so complicated for ourselves? There were 190 plaques for 201 dead. And there was a bowl of poppies. 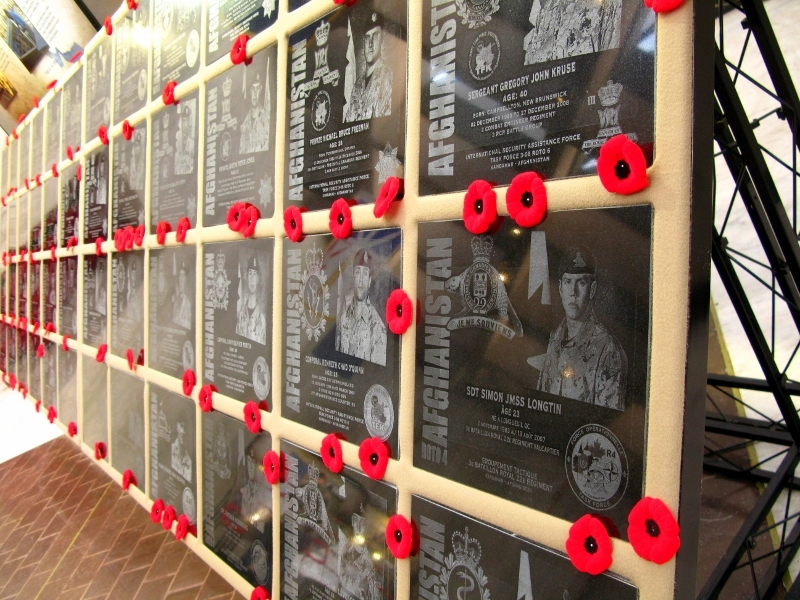 Visitors could stick the poppy pins next to those they knew or would like to have known. I got a little carried away as some had so many, and others so few. 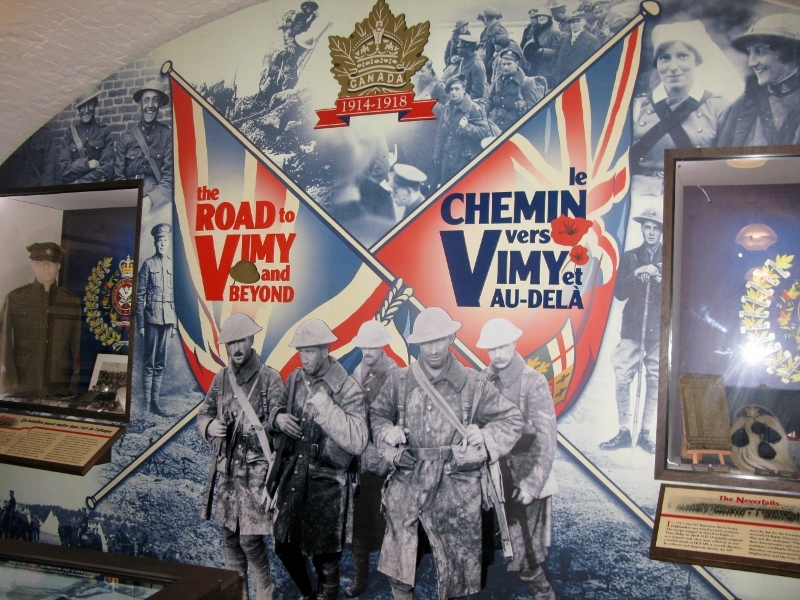 The exhibition is touring Canada and has to have an impact. I was moved. Very moved. It was staged in the Confederation Center of the Arts, built to commemorate the Canadian Confederacy. Back in 1964, every single Canadian donated 30 cents to build it – let’s think of that the next time we say we’re powerless to effect change or that tiny random acts of kindness are not worth the effort. 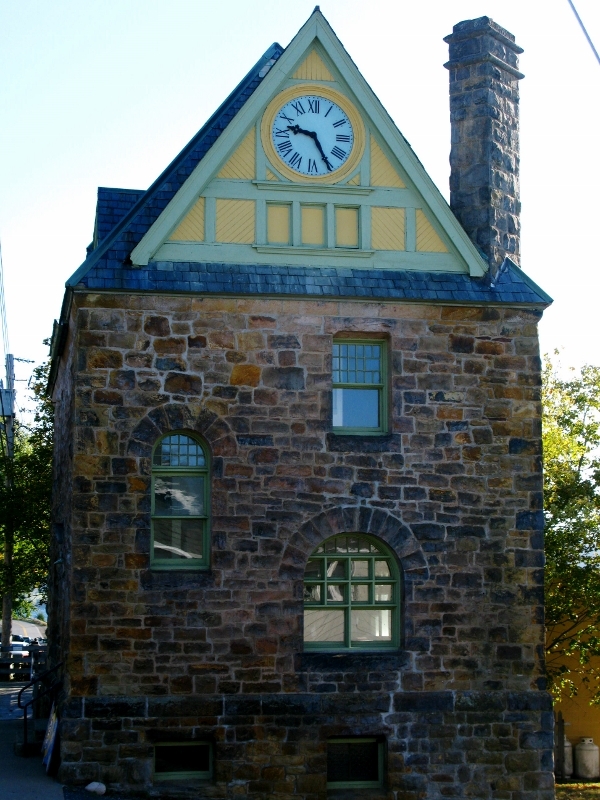 It was built to mark the centenary of the 1 September 1864 meeting convened in Charlottetown that would lead to the Dominion of Canada coming into being in 1867. 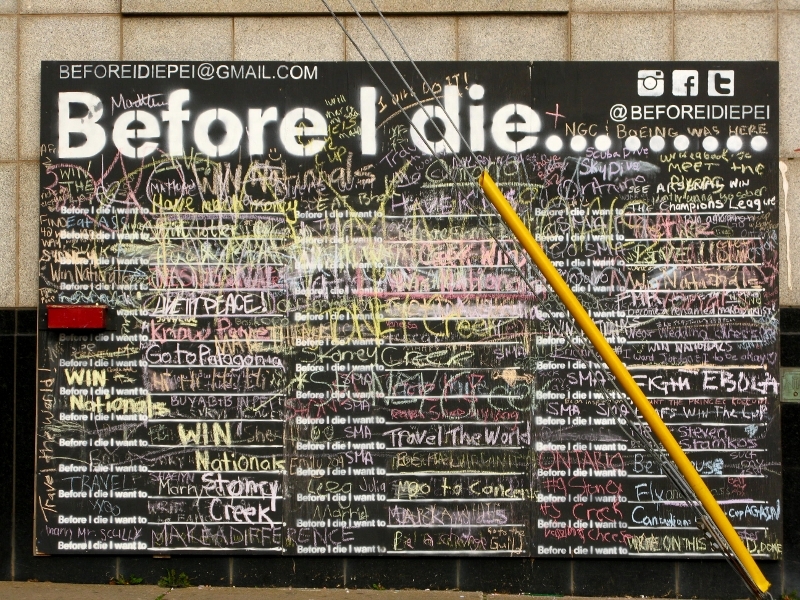 Perhaps particularly poignant, given the juxtaposing of birth and death in the city for me that day, was a large blackboard across the street enticing people to write about what they wanted to do before they died. It got me thinking. With little to choose from in the line of what was open to be seen, we headed up towards New London, the birthplace of L.M. 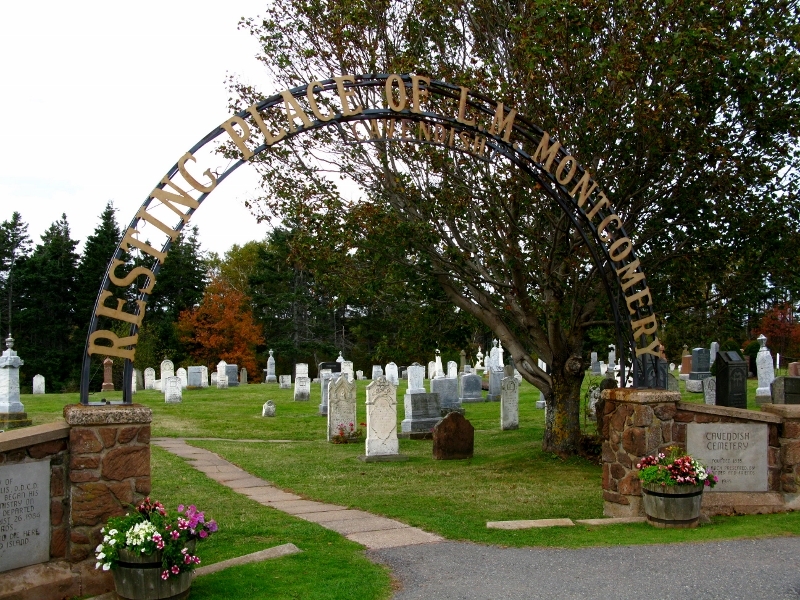 Montgomery, creator of the much-loved Anne of Green Gables. 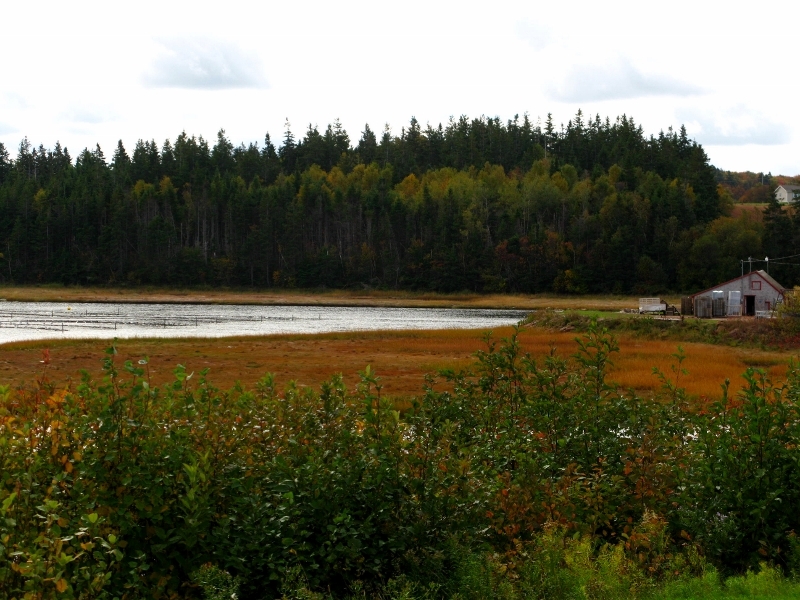 While PEI doesn’t have much in the way of trees and leaves and such it does have a lot of red clay and water. Spoiled for choice at which half-shut village we should stop at, we chose North Rustico because of the lobster pots and fishing boats. From there we finally got to Green Gables itself where we walked around and through the house that inspired the book. We took a few steps into the famous haunted woods and had a peak at Lovers Lane, bumping into many of our fellow ferry passengers from the day before. Did I mention that PEI is Canada’s smallest province with a population of about 140 000 in total … when everyone is home… and that it closes once the season is over. Anyway, back to Maud herself. 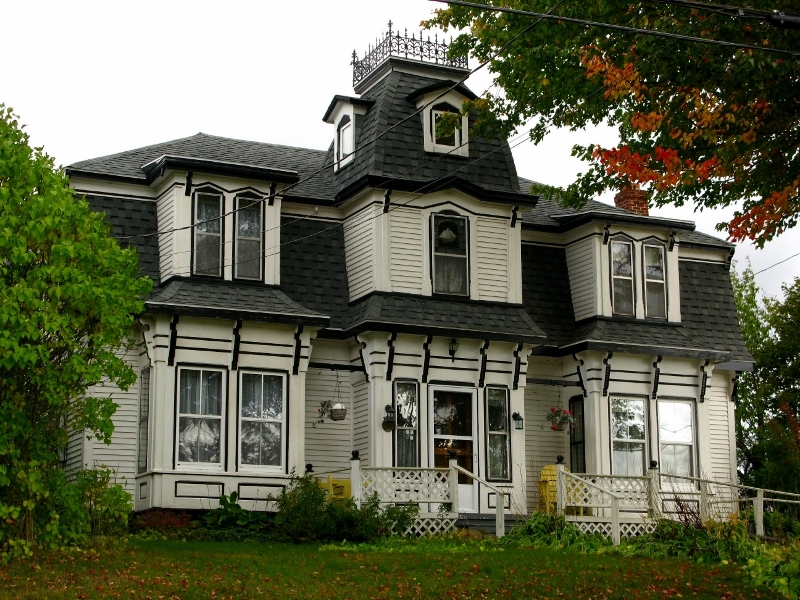 Although she moved away when she got married, she was brought back to PEI, the setting for 22 of her 23 books, when she died. The local cemetery makes no bones about claiming her for its own and were I buried there, I might be a tad peeved that I didn’t get equal post-mortem billing. 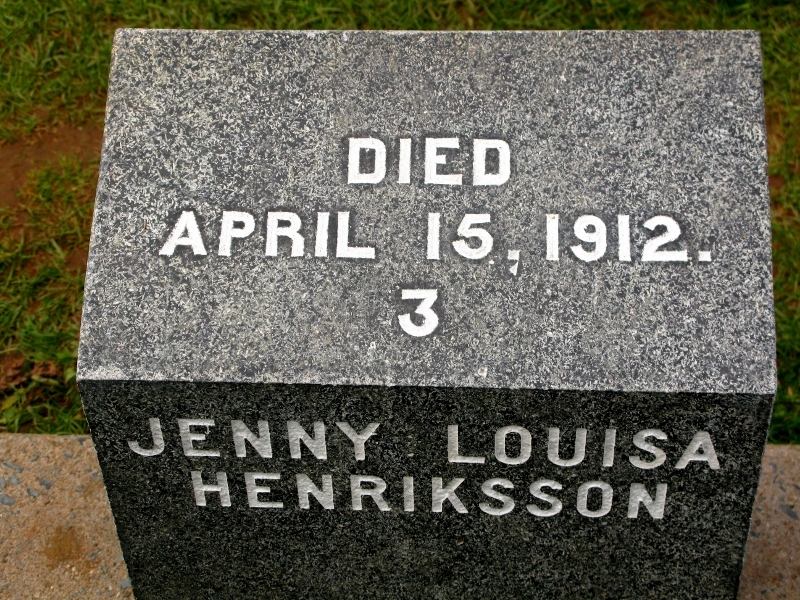 But then I saw her tombstone and mentally congratulated whoever had the idea of emblazoning her name over the entrance. 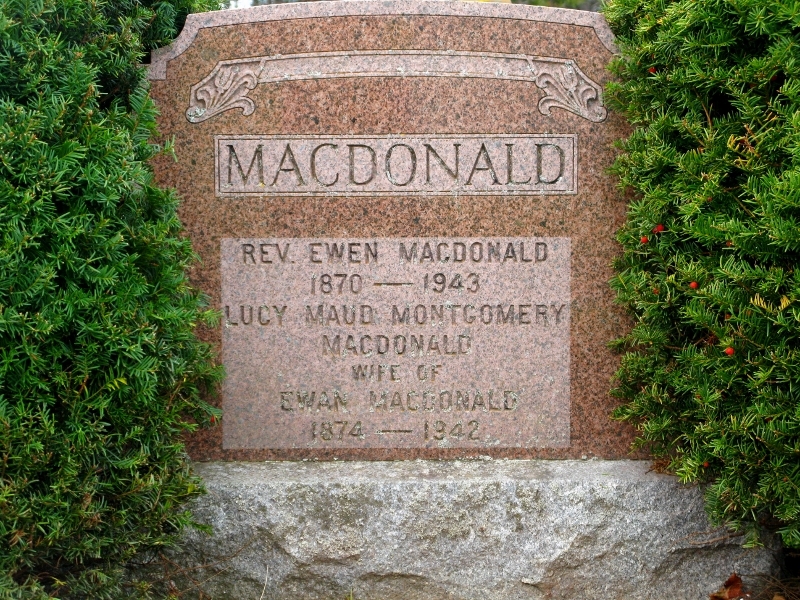 Although internationally acclaimed as an author and loved by millions, the sole achievement mentioned on her headstone is that she was some man’s wife (a man, who apparently, suffered from what was then known as ‘ religious melancholia’, said to be the rapturous transports of prophecy and inspiration experienced by hermit saints and prophets). I ask you! And she died first but gets second billing. Honestly. It has always seemed to me, ever since early childhood, amid all the commonplaces of life, I was very near to a kingdom of ideal beauty. Between it and me hung only a thin a veil. I could never draw it quite aside, but sometimes a wind fluttered and I caught a glimpse of the enchanting realms beyond – only a glimpse – but those glimpses have always made life worthwhile. 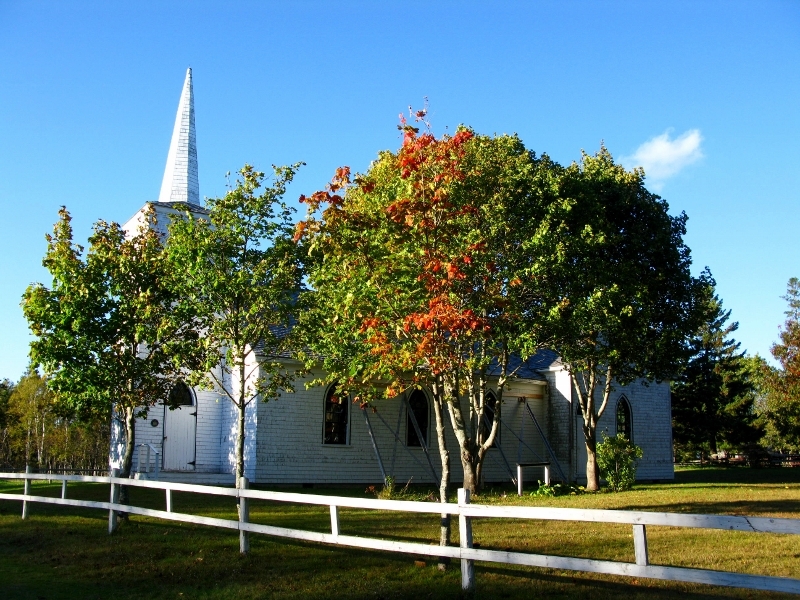 Th town of Green Gables itself was closed – mercifully. It’s morphed into a theme town built around a book. It must be horrendous in the summer – oops – in the season – with its fast-food joints, ice-cream parlours, and crazy golf. Just up the road in New London, stands another house – the one in which Maud was born, but we didn’t venture in. 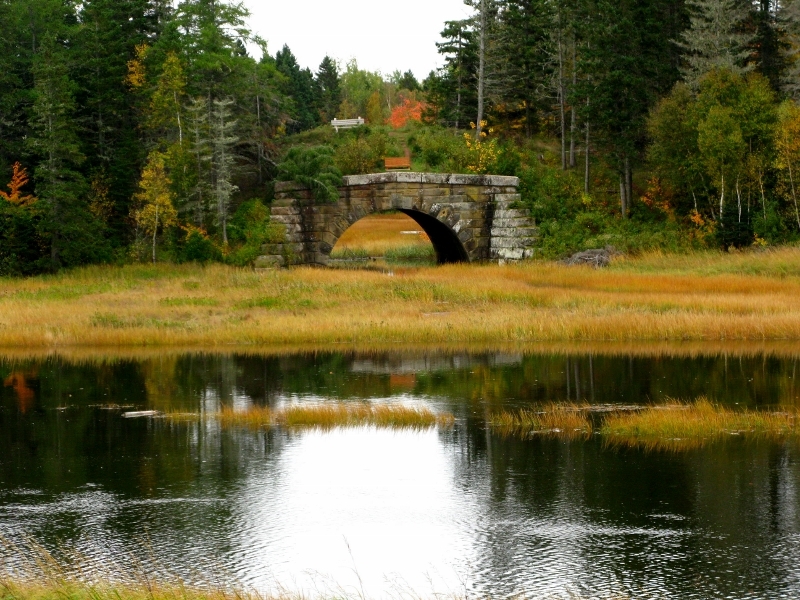 We had a bridge to cross and an appointment with New Brunswick. The journey to the south of the island was slightly more colourful; it was lovely – in places – really lovely. 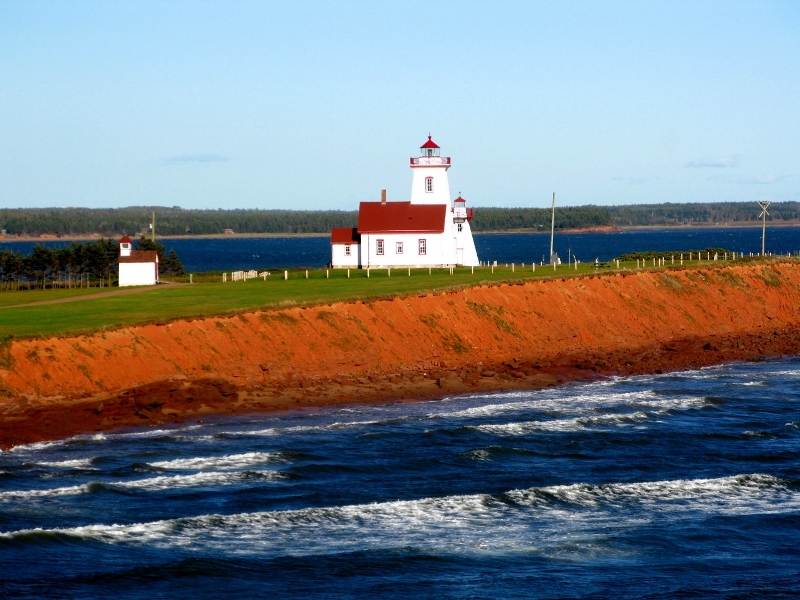 But after Cape Breton and Nova Scotia, PEI just didn’t do it for me. It seemed like its get-up-and-go and got up and gone. Yes, it had its moments. And yes, I’m glad I visited. 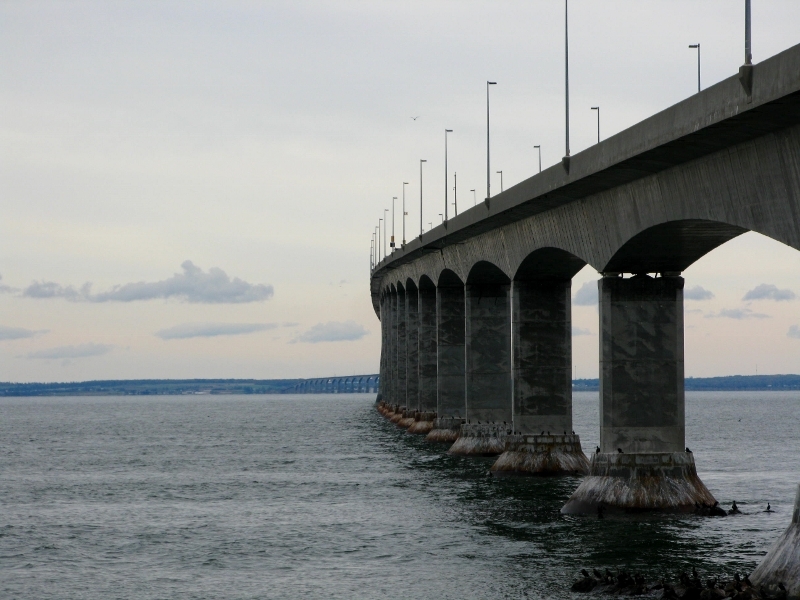 And yes, it was nice to pay my respects to Maud, but no – I’d not be in a hurry back – except perhaps to cross the Confederation Bridge again – now there’s a piece of engineering. At 8 miles (12.9 km), it’s the longest in the world crossing ice-covered water. It doesn’t even make the list of the top 15 longest bridges (much to my surprise… but then, my world trivia is nearly as bad as my geography….). 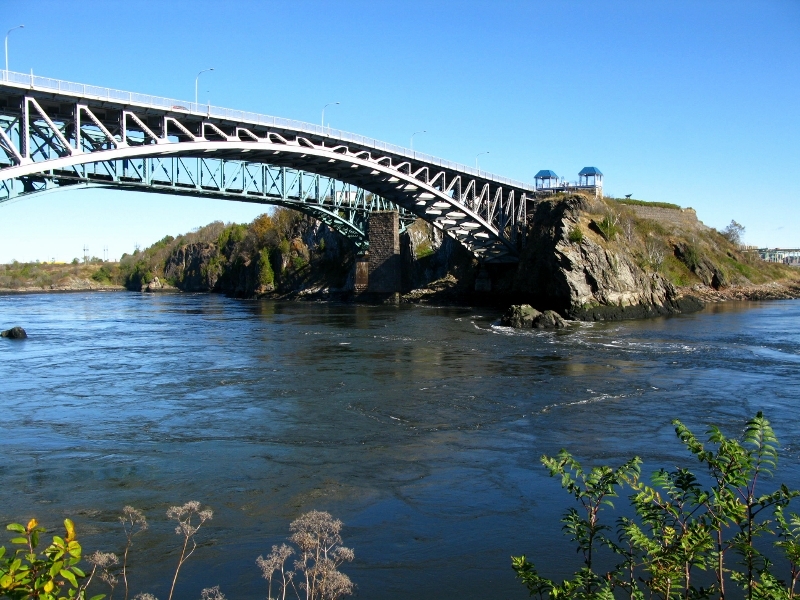 In operation since 1997, it caused some degree of uproar when the idea of a fixed, year-round link to New Brunswick was mooted. When it went to the polls, just under 60% of the islanders voted in favour and there ya have it. You can take the ferry over to the island (as we did) and ferry back, or take the bridge. Whichever way you do it, you pay CAD45 when you leave – that would certainly add to the expense of a daily commute. Margaret, you were right. PEI does close for the season. But to be honest, dear, as we were already en route, ’twas a little late to be telling us. Were I to go back, I’d be sure to get tickets to the Anne of Green Gables musical in Charlottetown. I’d definitely have scallops wrapped in bacon at the Gahan House again. And this time I’d try to get a tour of a few lighthouses. That’s now what I want to be when I grow up – a lighthouse keeper. Time is a wonderfully malleable thing. We think that have just 24 hours in a day, 60 minutes in an hour, 60 seconds in a minute – and while we do, how we use that time can make it stretch interminably or just fly by. Nova Scotians manage to stretch time beyond endurance. They never seem to be in a hurry and yet find a multitude of ways to cut corners, reallocating time they might spend (read: waste) doing one thing to doing another. 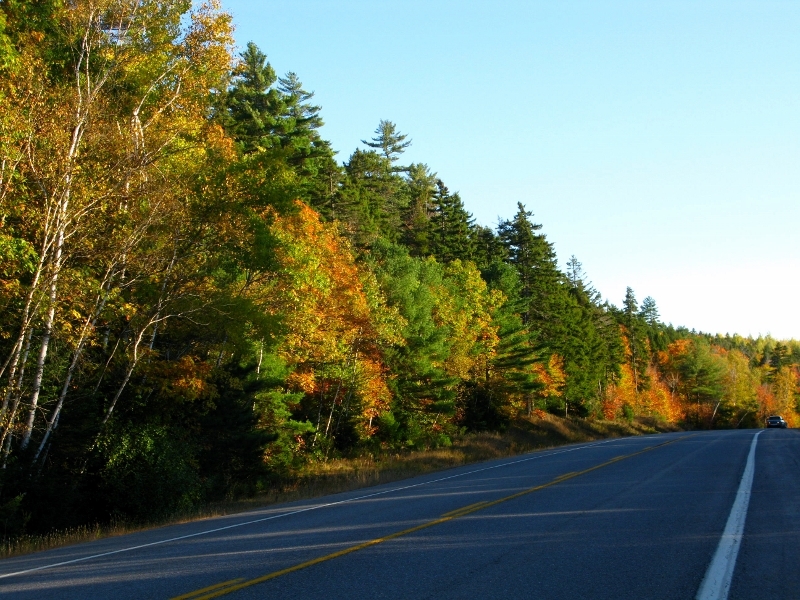 The drive to Baddeck could have been done by road, but we were reliably informed that by driving 7 km out of our way (anti-intuitively), we could catch a ferry that would take 25 minutes off our total trip. So we did. And it worked. We didn’t even have to brake before rolling onto the ferry – perfect timing – and barely had time to cut the engine before it was time to roll off again. 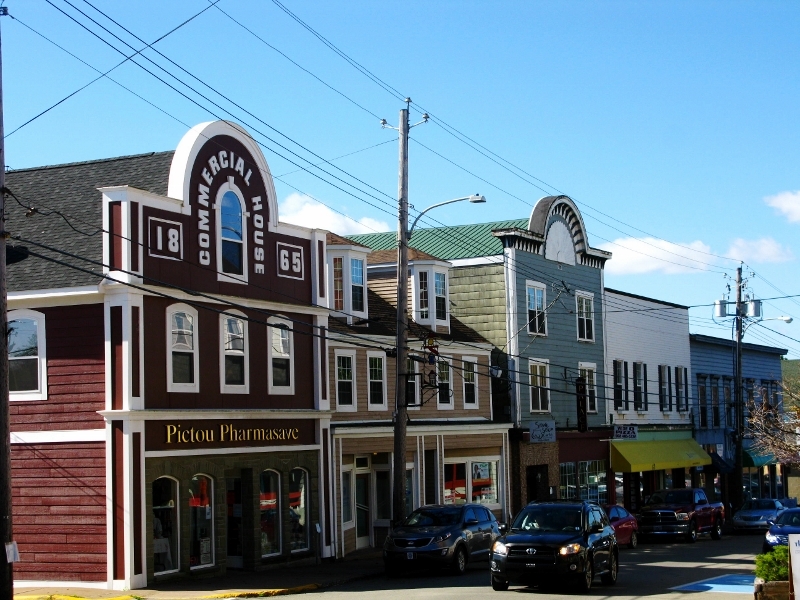 Baddeck is a lovely little town on the edge of the Bras d’Or lake (try as I might, my tongue refuses to budge from a Brass Door pronunciation). Known by the Mi’kmaq Indians as Petoo’bok – a long dish of salt water, the French preferred the more arty Bras d’Or – arm of gold. 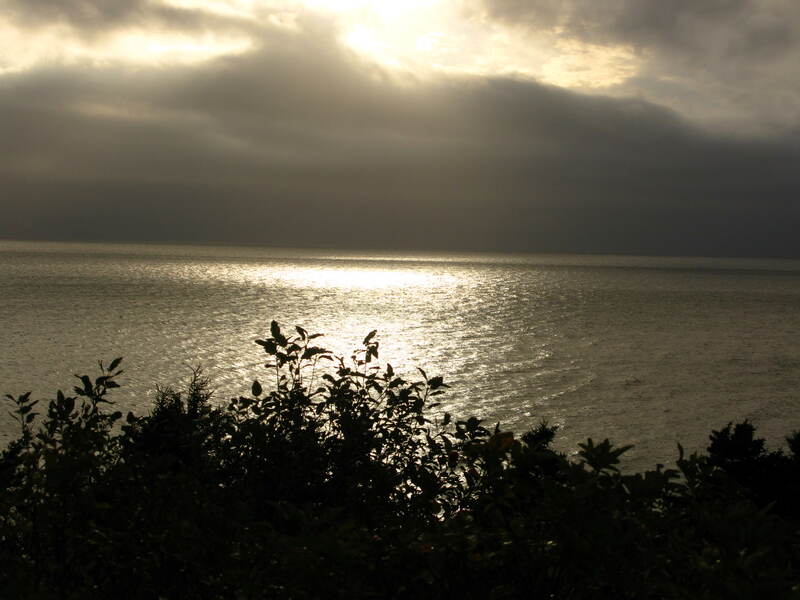 At first we thought it was as series of lakes but no – apparently it’s Canada’s largest inland sea – of sorts. It’s both saltwater and freshwater (as in both species live in it) with five rivers and two ocean channels feeding into it. UNESCO has named it a biosphere reserve (a new one on me – apparently a place where people live in harmony with nature; I have to wonder whether it was the people or the nature that won the appellation). 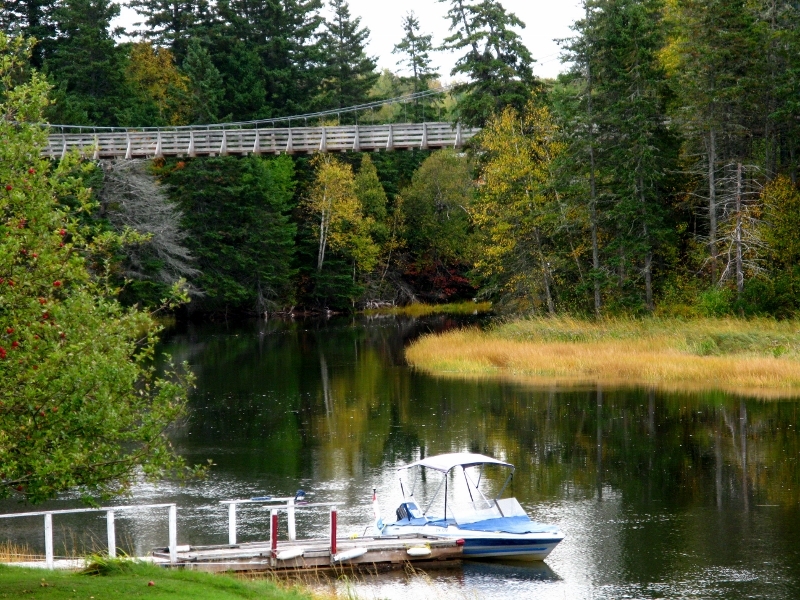 Apart from being known for its yacht club and the start and finish of the Cabot Trail, Baddeck was also the summer home of Alexander Graham Bell – and it makes the most of it. We resisted the urge to visit the interactive Bell museum, and instead spent the time debating whether he or Marconi could lawfully claim the telephone as their own. 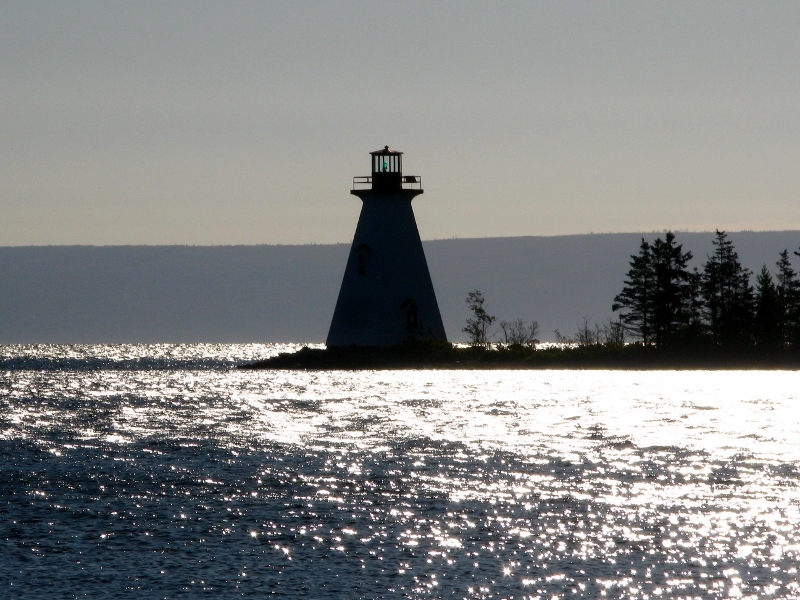 But we debated over coffee in full view of the lighthouse with the sun reflecting on the water – as good a place as any to have a friendly bargy in the early hours of Thursday morning. It was here, in Pictou, back in 1773 that 200 Highland Scots disembarked from the good ship Hector and went about making the town their home. So successful were they that others followed in their wake and pretty soon this wave of migration gave rise to the birth of New Scotland. 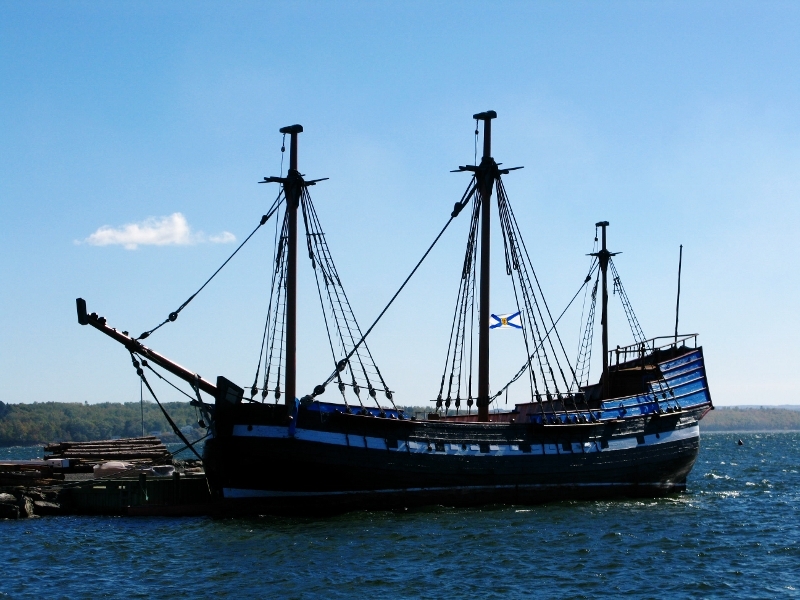 A replica of the ship is docked in the harbour today and it’s generally assumed that if you visit Pictou, that’s why you’re here. But, needless to say, if you visit in October, the museum and the heritage site will have closed for the season – like most of the town. 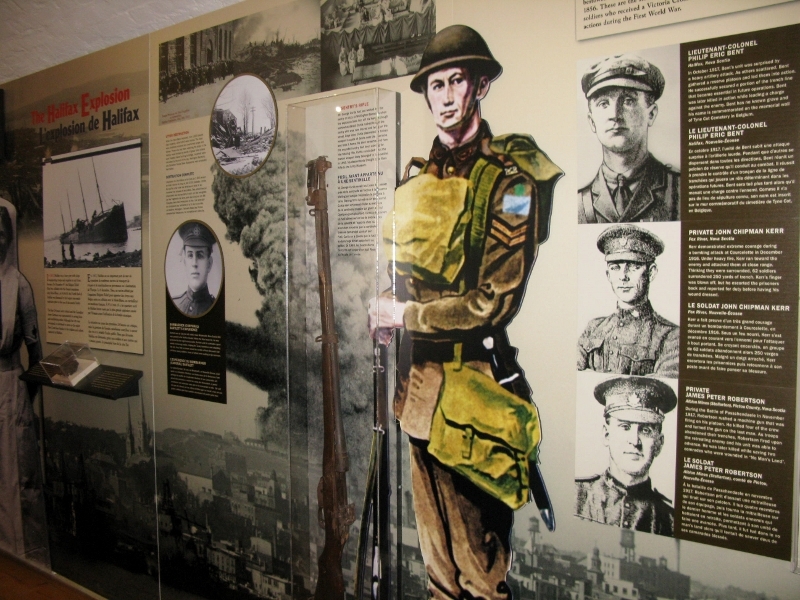 Perhaps it was the Scots that set the tone for firsts in this town – they’re not exactly short on temerity – but it was here, too, that Canada’s first and only black battalion was born. The boys fought in WWI, forming their own segregated unit when they’d been turned away time and time again from recruitment centres. 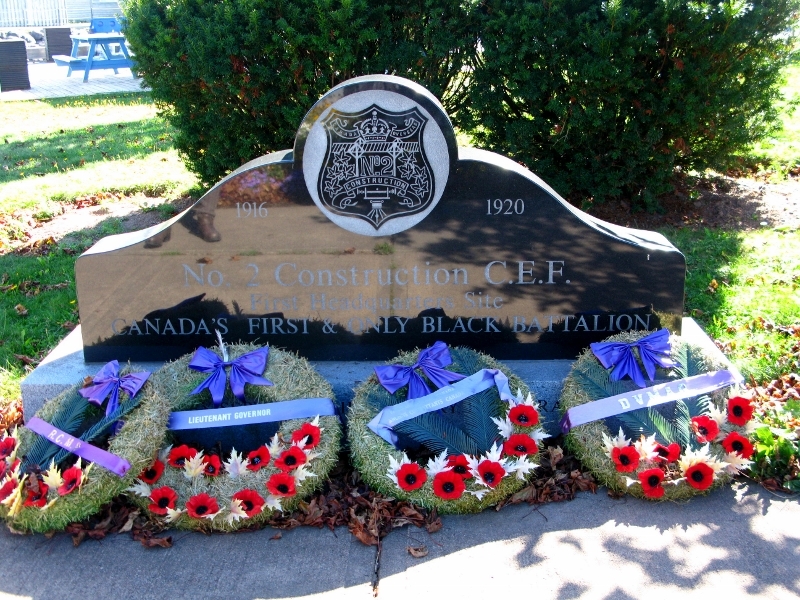 Although based in Pictou, they included men from Ontario, too, and the Honorable Captain William Andrew White – the only Black Commissioned Officer in the British Army in WWI. Not bad for a small town. 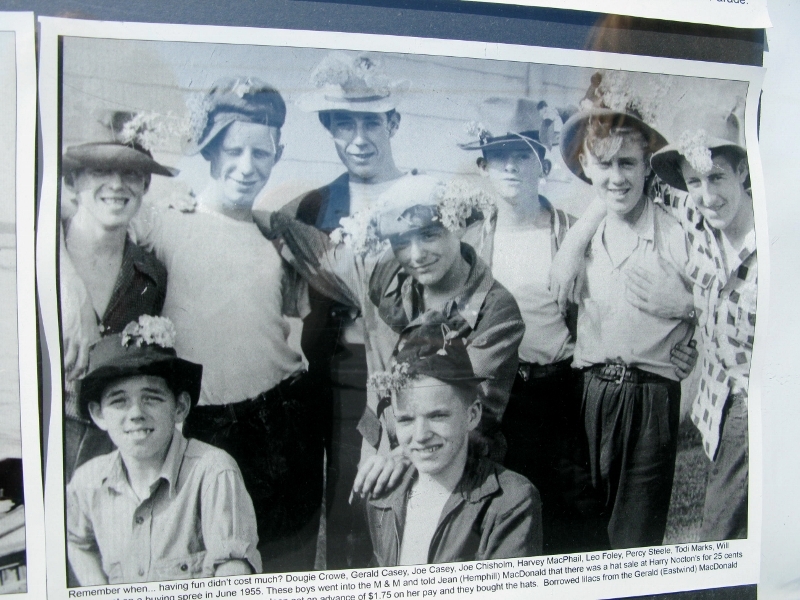 While the Pictou Academy was the first school in Nova Scotia that any student could attend, regardless of their religion, men were also put in the pillory for three hours for kissing their wives on a Sunday. One has to wonder at religion and its motives. 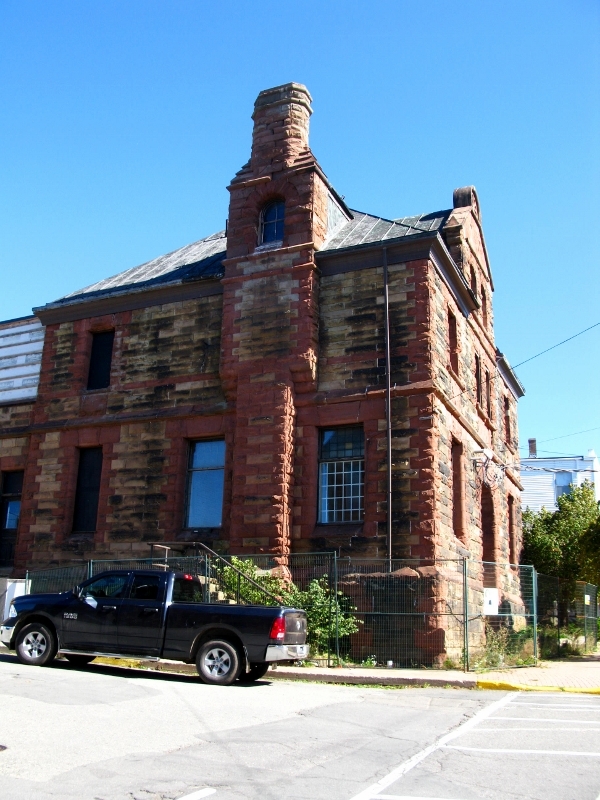 The old post office is apparently the only building in the world (the world, imagine) with a window in its chimney. And before it got the name it has today, the town was at various stages known as Coleraine, Alexandria, Donegal, Teignmouth, Southhampton, Wamsley, New Edinburgh and New Paisley. That in itself tells a story. From there we headed to Caribou to catch the ferry to P.E.I. 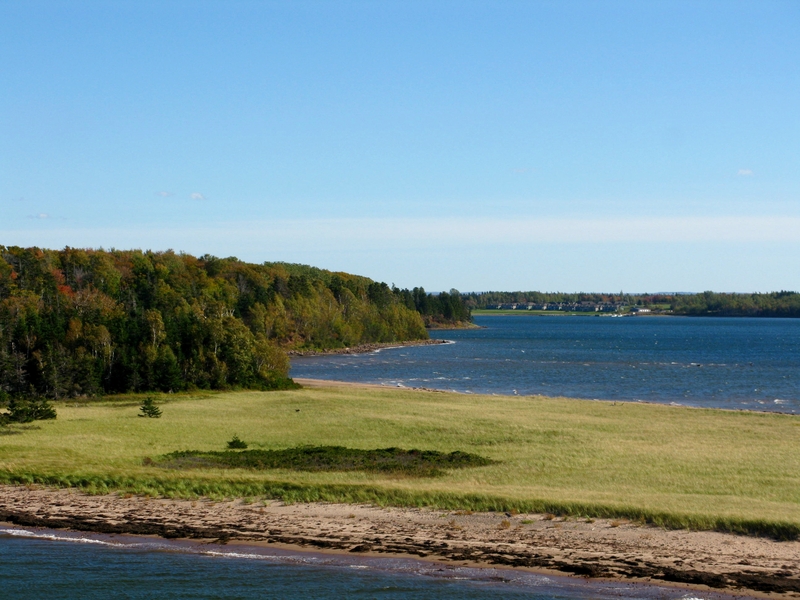 (aka Prince Edward Island, home of the spuds) at Wood Island. 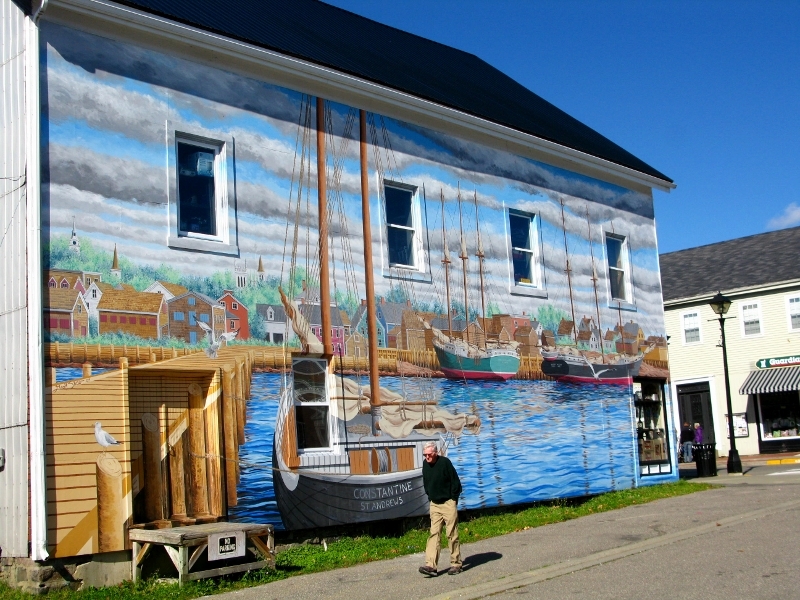 It was time to leave Nova Scotia and venture into Canada’s smallest province. As we sailed out of the harbour, the gulls lined up to watch. 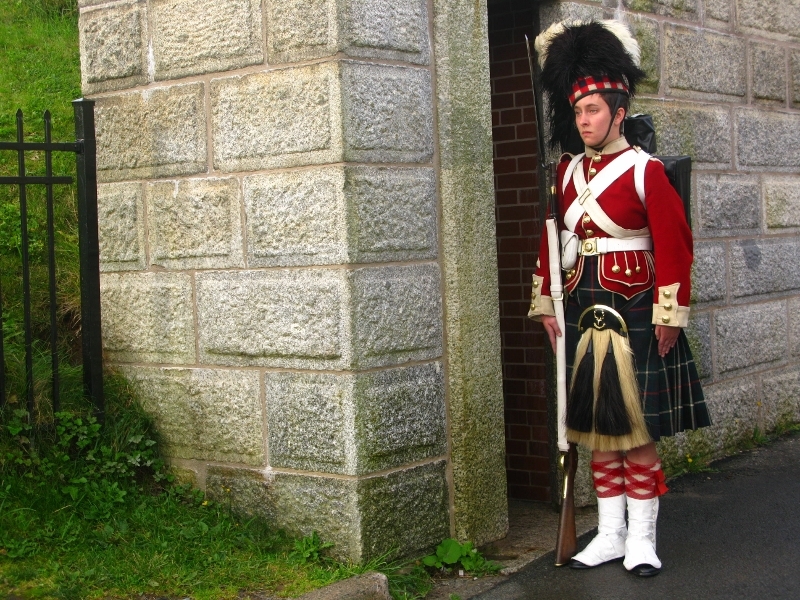 An amazing send-off, almost like a guard of honour, that did Cape Breton proud. The journey would take 90 minutes and although parked in line for nearly 45 minutes before departure, we were one of the last to board. Of course, we’d forgotten it was Thanksgiving weekend in Canada and the world and her mother were either going home or going to PEI for the long weekend. I popped by the Ferry’s information desk and asked for a map of the island – just to be prepared. The ever-s0-helpful Margaret asked me where I wanted to go on P.E.I. I said I wanted to see Pugwash. ‘Oh dear’, says she, ‘that’s in Nova Scotia’. Okay, I thought, once again cursing my geography (or the lack thereof), what about Green Gables? 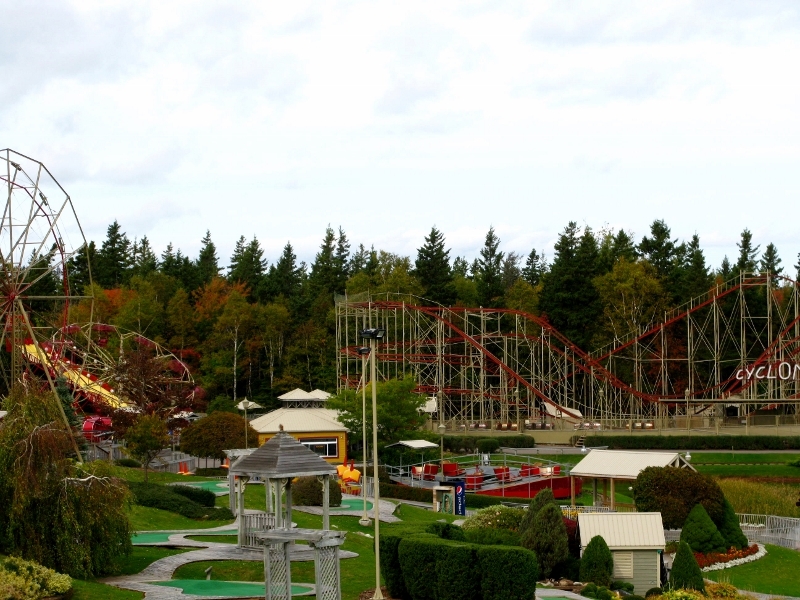 She thought for a while before dropping the bombshell – ‘It’s not a great time to visit, dear, as the whole place practically closes after the season. 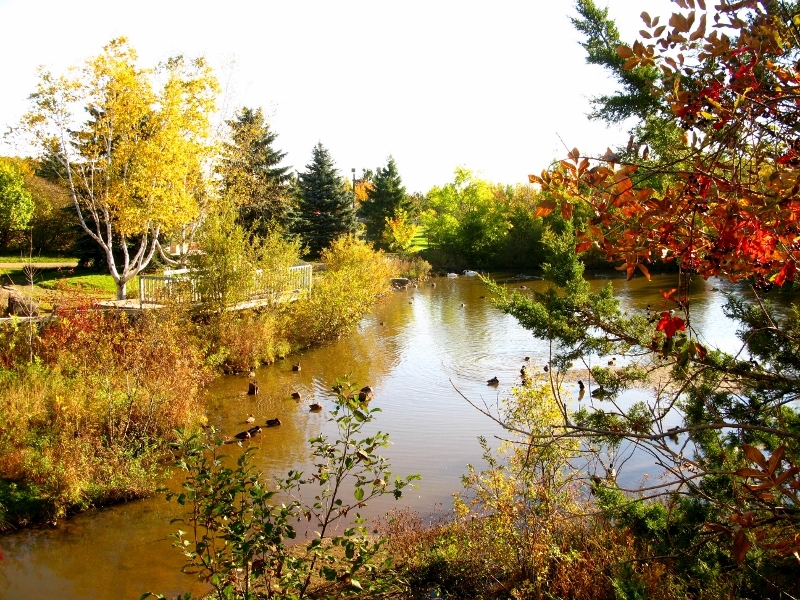 Best stick to Charlottetown – it’s sure to still have some places open.’ With a vague stirring of disquiet, I went out to the viewing deck and shared the good news. Still, at least the world that was passing us by was worth looking at. You sure you know where you’re going? he asked. 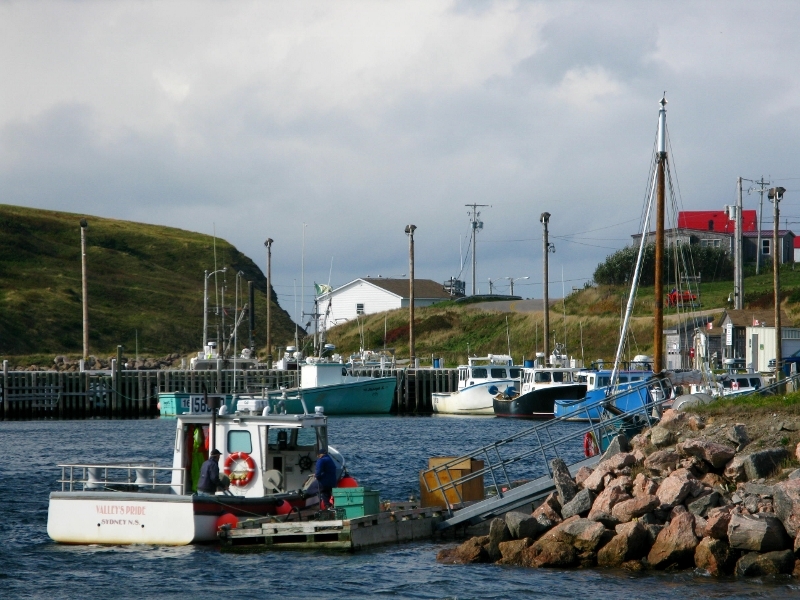 Absolutely – Meat Cove – most northerly point in Nova Scotia. It’s at the end of this road, isn’t it? Sure is. But are you sure you want to go there? he persisted. I met Eric on the Cabot Trail, about 11 km from Meat Cove. He drives a gravel truck. We were stopped by a flagger on a road under construction and we got chatting. As you do. He told me that bloodlines were very thin in Meat Cove. And that the cops dared not venture in. Shoot-outs weren’t unusual and, as Chuck (another trucker) would tell me later, the foundations we would see were not new houses waiting to be built, but old houses that had been burned out ‘cuz the locals didn’t like ’em. We were on the Cabot Trail. 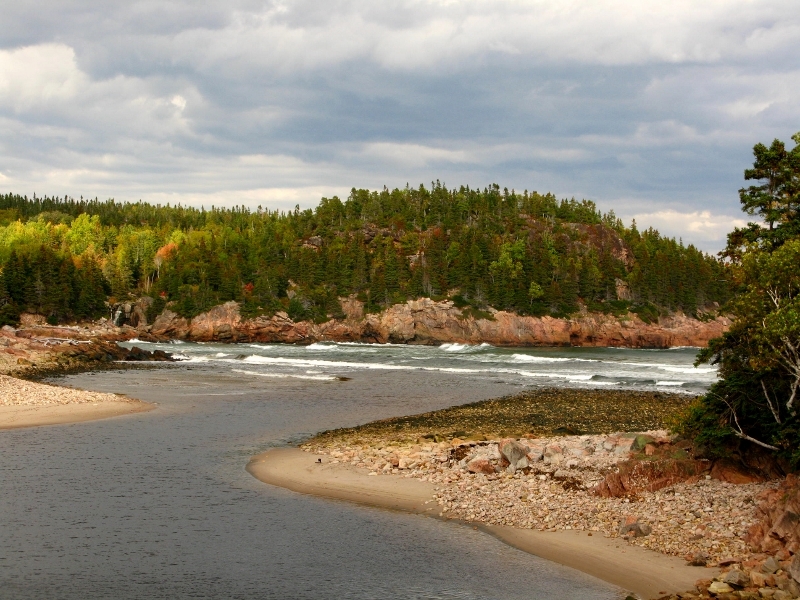 We’d left Margoree Harbour that morning and had driven into the Cape Breton Highlands National Park. The scenery was nothing short of spectacular. 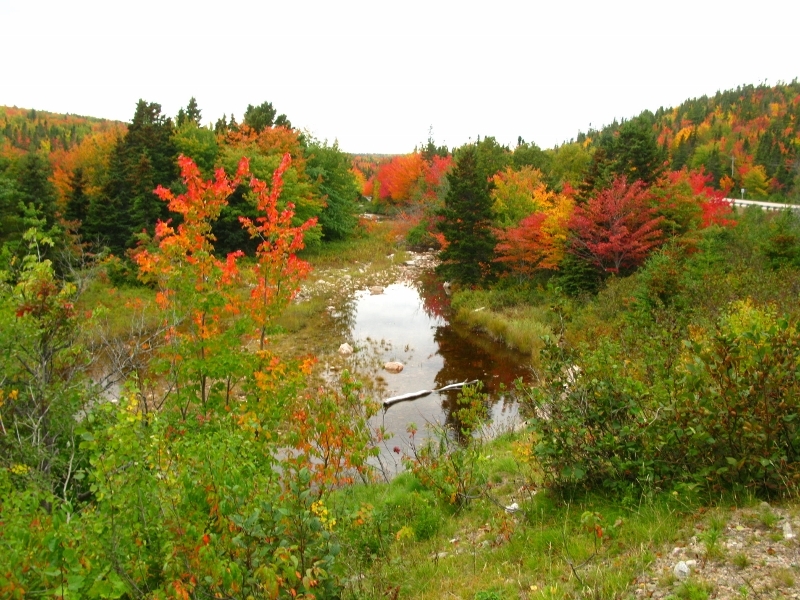 It was like driving through a Monet exhibition, had the great man ever painted autumn. As the day progressed, we wended our way in and out of the park, stopping here, there, and yonder, with little aim other than to reach Ingonish by six-ish or seven or whenever. 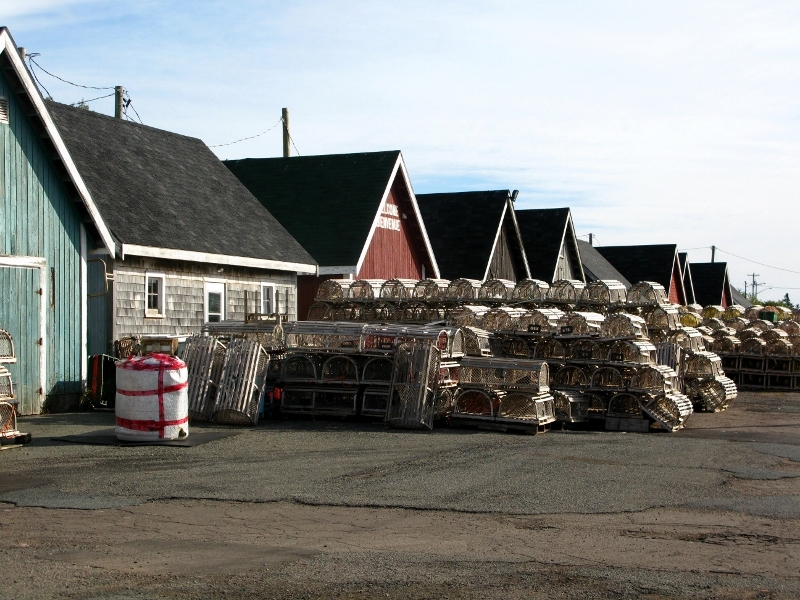 We ran into Chéticamp, famous for its hookers – and no, I don’t mean boats or prostitutes, I mean rug hookers…people who use hooks like crochet hooks to make rugs. The things ya learn on the road. 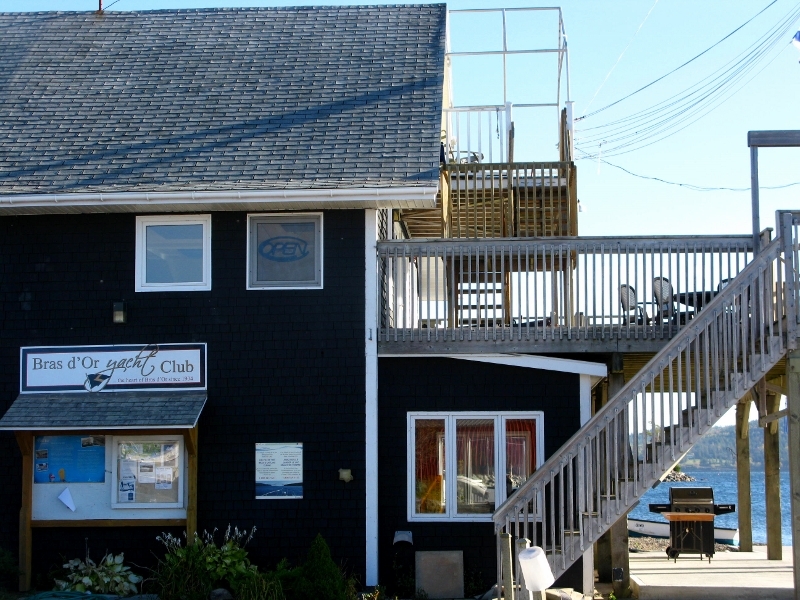 We sailed past Pleasant Bay and declined all offers that guaranteed us a whale sighting – it was if we’d been divinely inspired and knew what awaited us at Meat Cove. 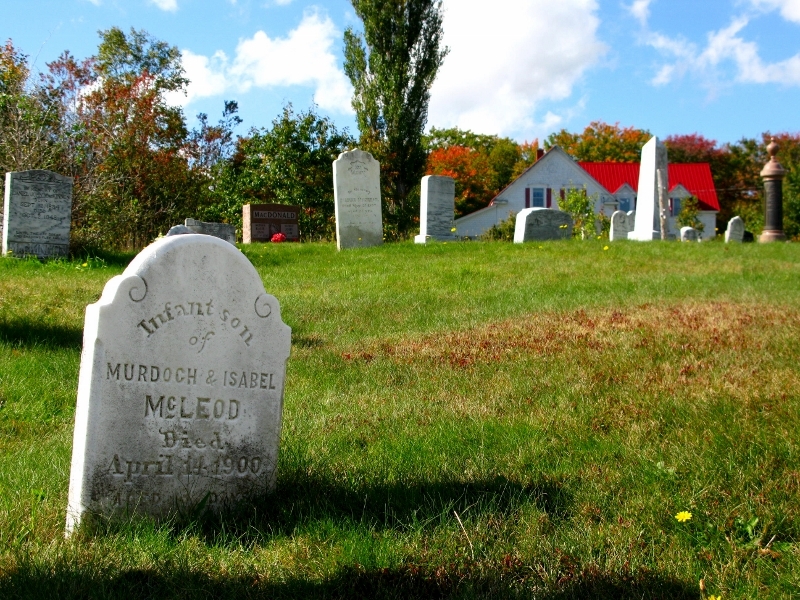 We stopped at Cape North where the North Highlands Community Museum was closed (qu’elle surprise) but the local cemetery was open – and full of McLeods. 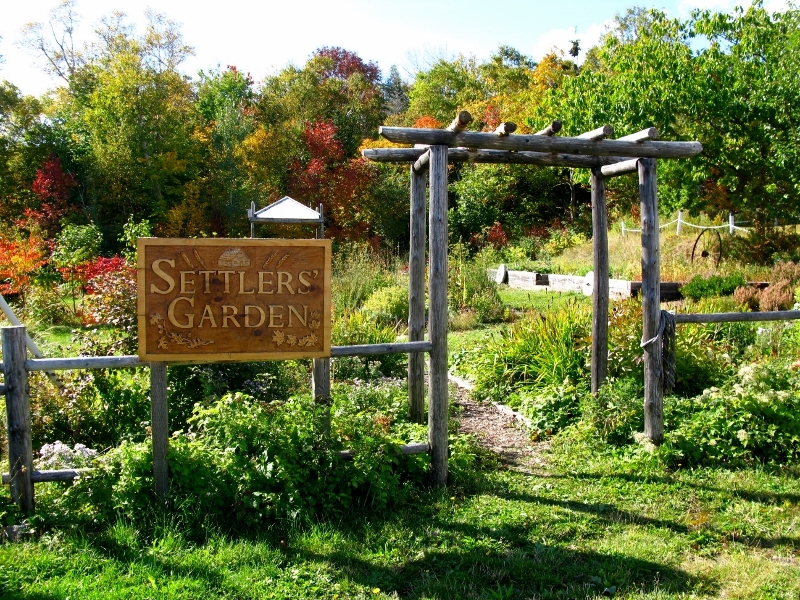 The Settlers Garden represents, in miniature, the natural and cultivated world of the early European settlers who made their homes in the North Highlands of Cape Breton. I tell you, these lads have it sussed – simplicity all the way and ten times as effective and emotive than the grandest of displays. From there we took the road to Meat Cove, as advised by Gordon, our host the night before. Some miles in, we hit construction, where I met Eric. Some might well have been put off and turned around … but I’d never seen a thin bloodline or witnessed a shoot-out with shots being fired and I was curious. When we finally got to the end of the road, it was beautiful – yes. There was a humpback whale playing in the water, and he a shameless exhibitionist at that. Magnificent. There were two restaurants – one of which was closed and the second didn’t have enough veg in the kitchen to make a salad. Enough said. Waiting for the flagger to take us back up the trail, I got chatting to Chuck. He’d been part of a work crew there to lay gravel for 12 days and he couldn’t wait to get home. He was a big man. A tough man. And he was casting furtive glances over a massive shoulder and speaking in whispers. We didn’t hang around. Before we left though, I did ask one of the four locals I saw (there are nine families in total….) 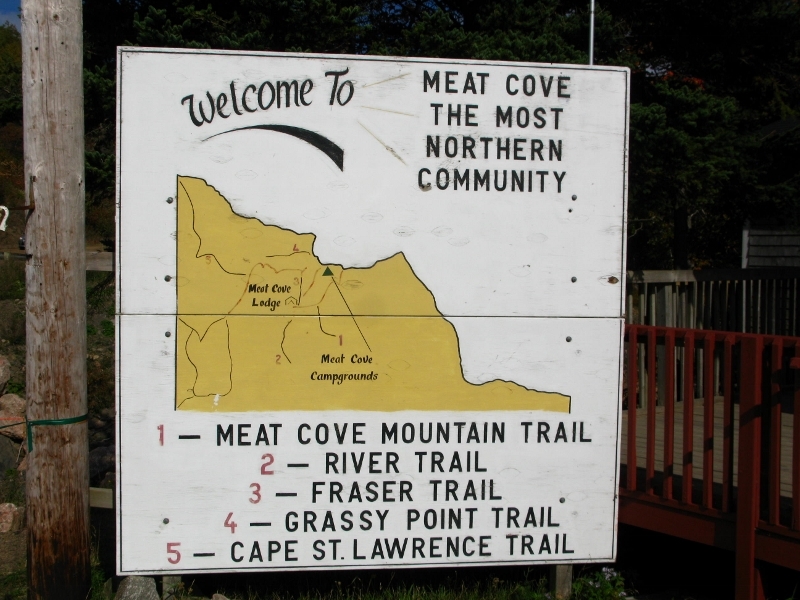 why it was called Meat Cove. Back when, I don’t know the date, sailors used to drive by and see caribou. They’d get out and hunt and so it came known as meat cove. Enough said (I said that already, didn’t I?). Still, I got to chat with Chuck and Eric and have breaded clams from Dingwall, enjoy the thought of a salad, and see a whale relatively up close and in mammal. Not bad for a Thursday afternoon in the boonies. 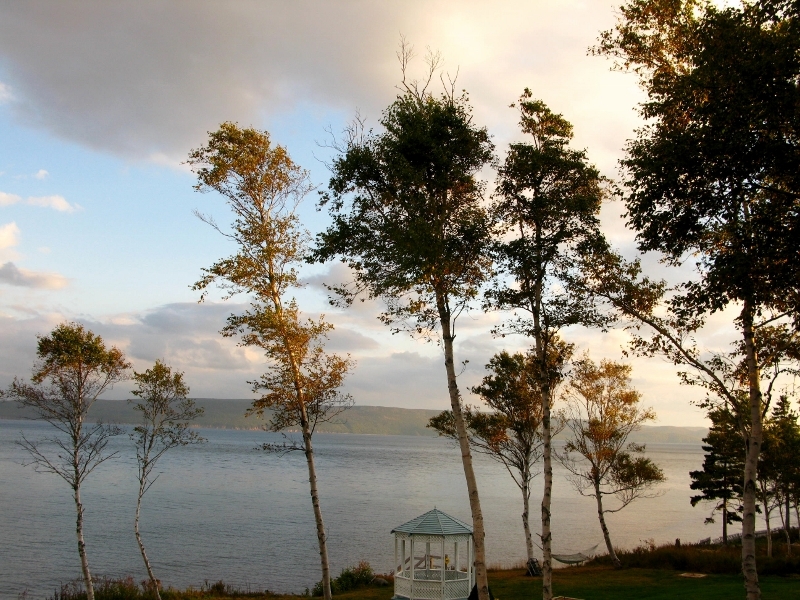 We thought we were staying in Ingonish but we were actually 45 minutes further up the road, closer to Baddeck. 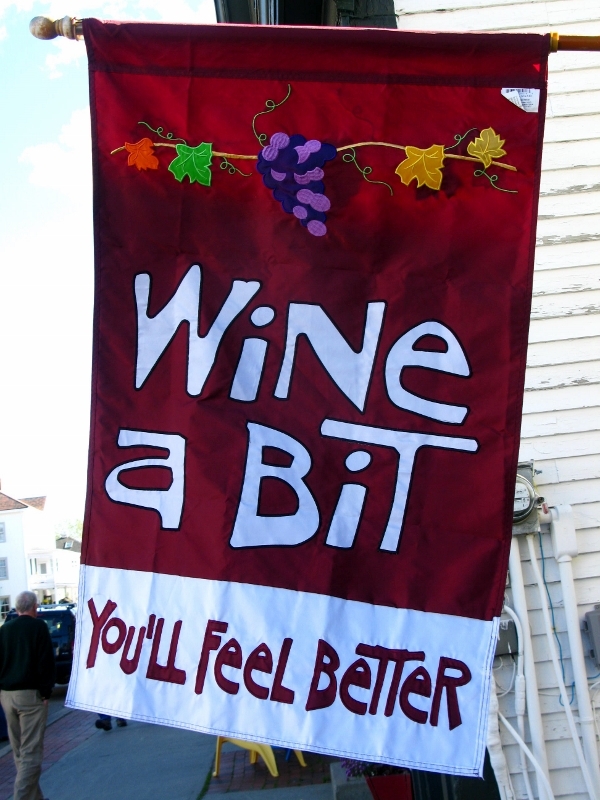 Prompted by some sixth sense (in honesty, more to do with the number of ‘closed for the season’ signs we were seeing), we dropped by the one liquor store we’d seen in two days. These Bluenoses are a clean living people – they don’t smoke, don’t seem to drink, and always obey the speed limit, even when there isn’t a cop within a hundred-mile radius. The place is pristine clean with not a rubbish bin in sight so they don’t litter either. Did I use the word ‘surreal’ already? 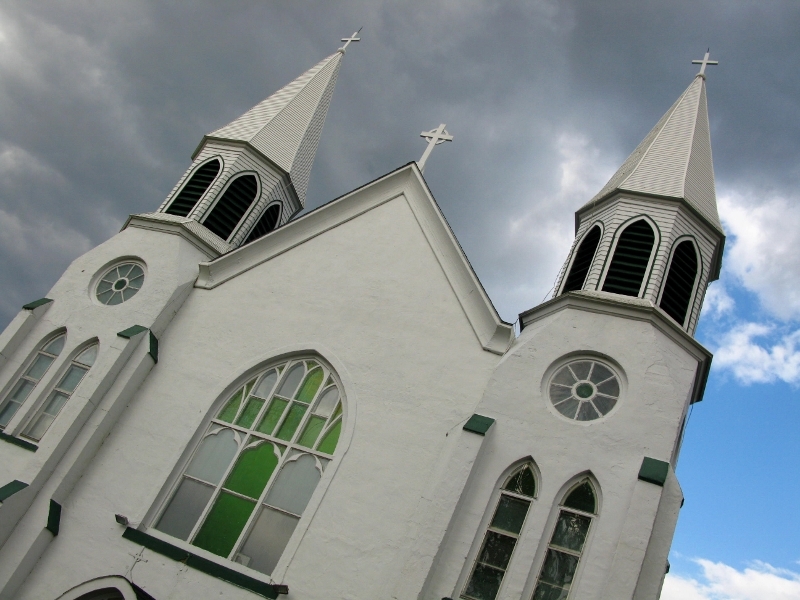 We passed plenty of churches of all denominations, shapes, and sizes. I wonder how so many of them make do with so few people – but they seem to work and what’s more, they’re open. Regular readers will be familiar with my rants about closed churches in Europe and how difficult it is to find one open and with candles. 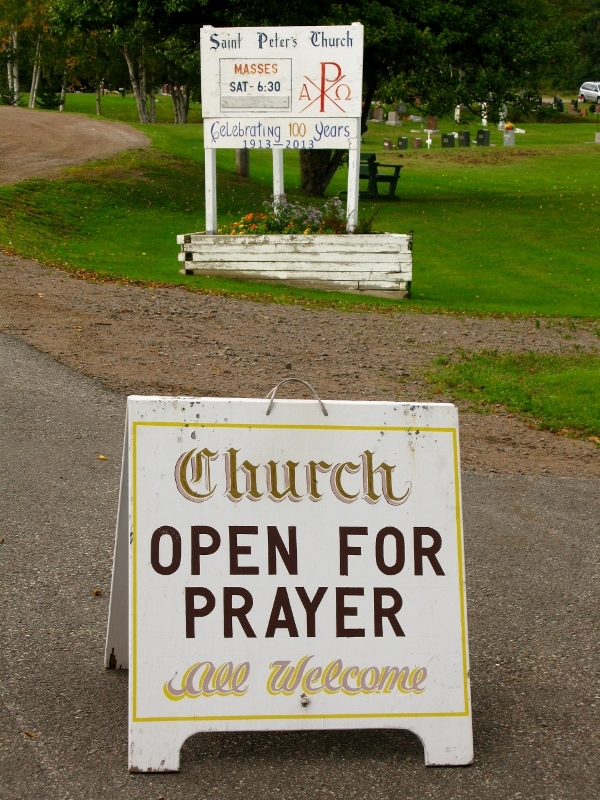 It was a pleasant surprise to see a sign, no less, saying that St Peter’s was open for prayer (without the candles though). 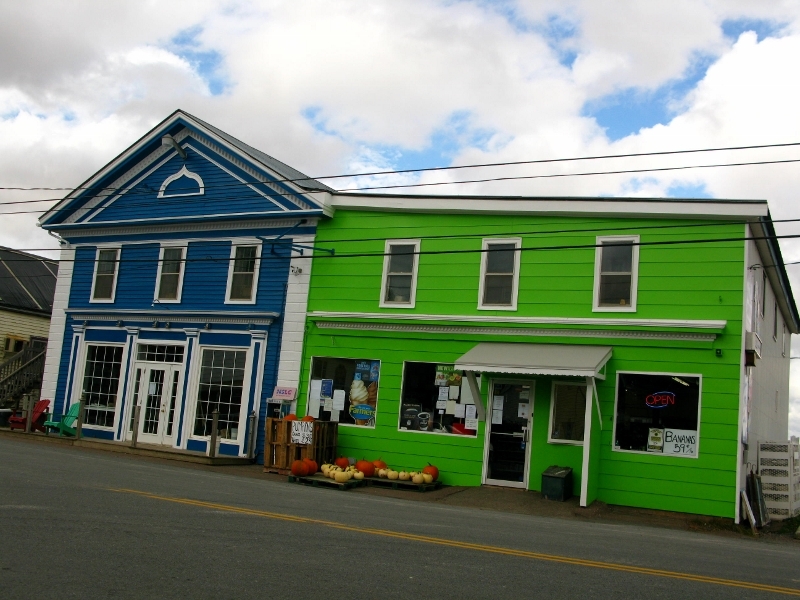 Unfortunately I can’t remember exactly what part of the road it was on but I think it safe to say it was the Baddeck side of Ingonish because we were still praying we’d find the Sea Parrot Inn before dark. Mind you, stopping as we did every ten minutes or so to marvel and something that was just as gorgeous as what had gone before, it was a wonder we got there at all. There are no words to describe the beauty of it all. A thousand adjectives couldn’t do it justice. 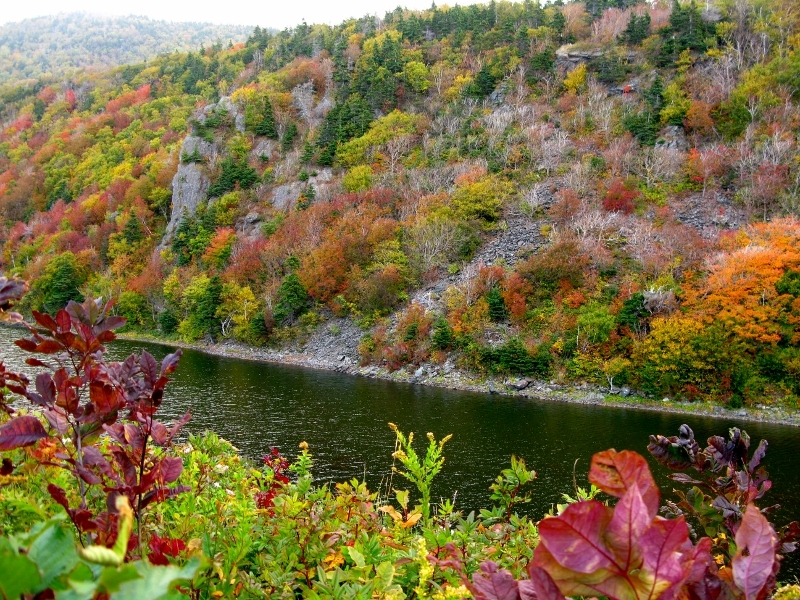 Billed as the most spectacular drive in the world, the Cabot Trail, in the autumn, has to be as close as you get to perfection on this earth. I would challenge the staunchest atheist not to wonder if there is a God because it is difficult to ascribe this sort of beauty to anything other than miracle. In a world of constant change, it’s almost gratifying to know that my abysmal sense of geography is still matched by my equally pathetic knowledge of history. It’s always been the case, despite getting an honour in both in my Leaving Cert. 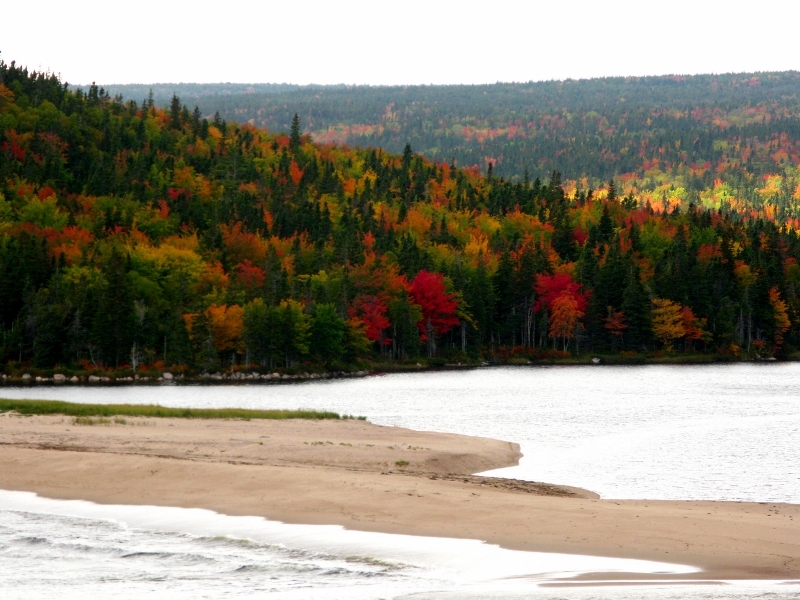 Driving north from Halifax up to Cape Breton had me questioning both. I knew we were heading north-ish – I could see as much on the map. But I wasn’t prepared for the Scottishness of it all. Duh. 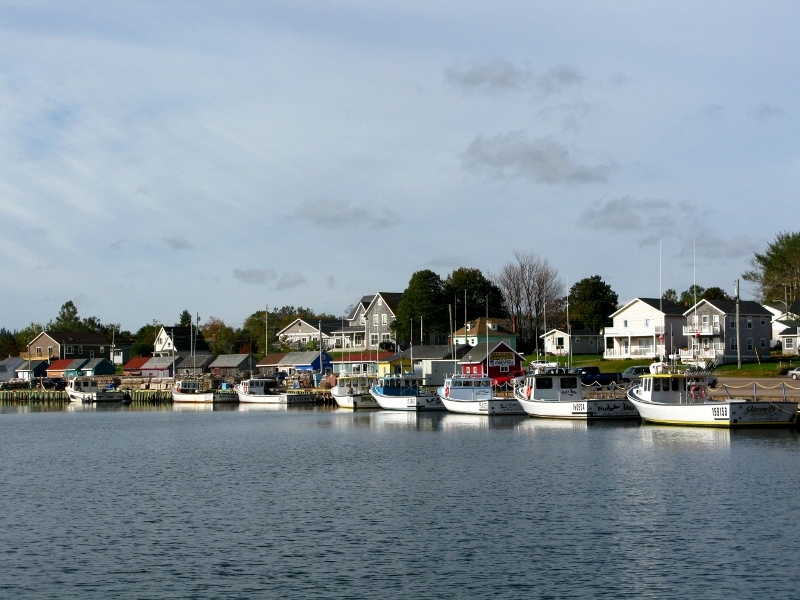 Nova Scotia – New Scotland, Canada’s second-smallest province. So why then was the chap on the radio speaking French while the signs showing names of rivers, mountains, lakes, and towns had a peculiar Gaelic translation? 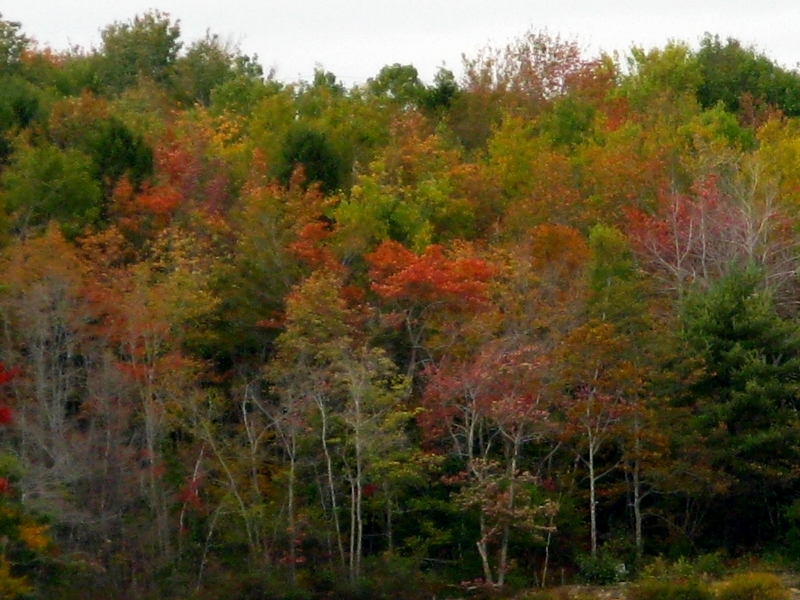 And what was with the fall colours – that wasn’t supposed to happen until we hit New England! People from this province are known as Bluenosers and not, as I thought, because it can get cold in winter – I honestly believed that to be true) but because of a ship – a fishing and racing schooner built in 1921. Store that one up for your next pub quiz. And they’re incredibly friendly. Talkative enough to be Irish and inquisitive enough to want to know what you had for breakfast, they’re not at all backward about coming forward. The banter is great. My mother would be quite at home and I was feeling like I’d lived here before myself. I’ve seen some horrendous house colours in my day and the colour combinations here border on being Csontváry Kosztka Tivadar like (which works on canvas rather well, but not on walls). We passed one café painted in mauve, lilac, and yellow but was a good mile beyond it before I recovered from the shock. Trust me. You didn’t want to see it anyway. But in the tiny towns that mark the route, once you get off the main drag, some of the houses are really gorgeous, even if they’re in the middle of nowhere. The one thing they all have in common is a spectacular view, particularly the more north you go. It is gobsmackingly gorgeous. We saw towns like New Glasgow and Inverness. And others like Antigonish (remember the poem?) and Tatamagouche (Mi’kmaq Indian names). We saw signs for Gaelic lessons, ceilidhs, and tin whistles. We saw names like New Dublin Road, Money Point, and Grafton Street. And the country music station had songs in French. I was finding it difficult to remember where I was, particularly when we happened across a distillery. We got there too late for a tour and at about $120 (€85, US$108) a bottle for the single malt, perhaps it was just as well that we didn’t get to taste it. Had we to do it again, we might well cough up for a bed in the inn itself and then sit and sample to our hearts content. Mind you, I’m not sure they’d appreciate me diluting mine with ginger ale. 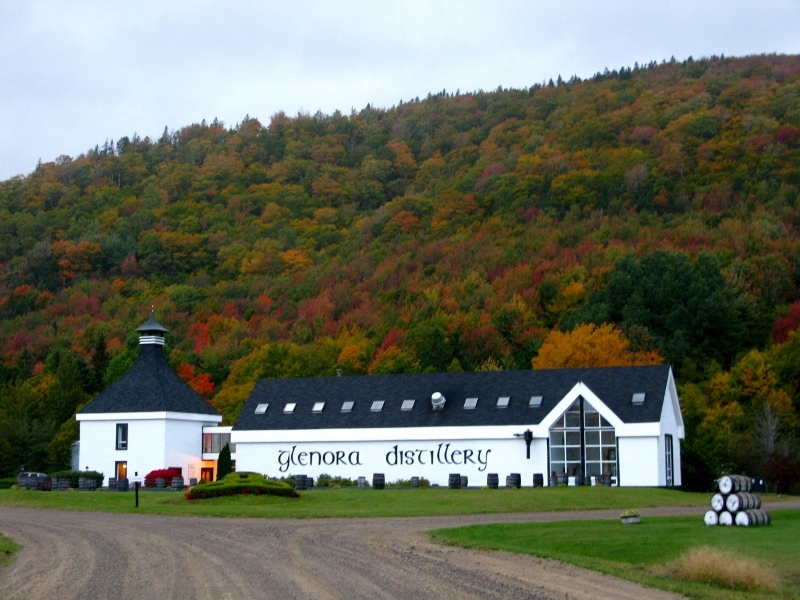 The Glenora is North America’s first single-malt distillery and has been distilling since 1990 and throwing ceilidhs every afternoon and evening, too. Still, it all adds to the New Scottishness of the place. There’s a oldie worldy feel to the region, particularly when you cross the Canso Causeway into Cape Breton, travelling on the Trans-Canadian Highway. Built back in 1955, the causeway is something to behold. 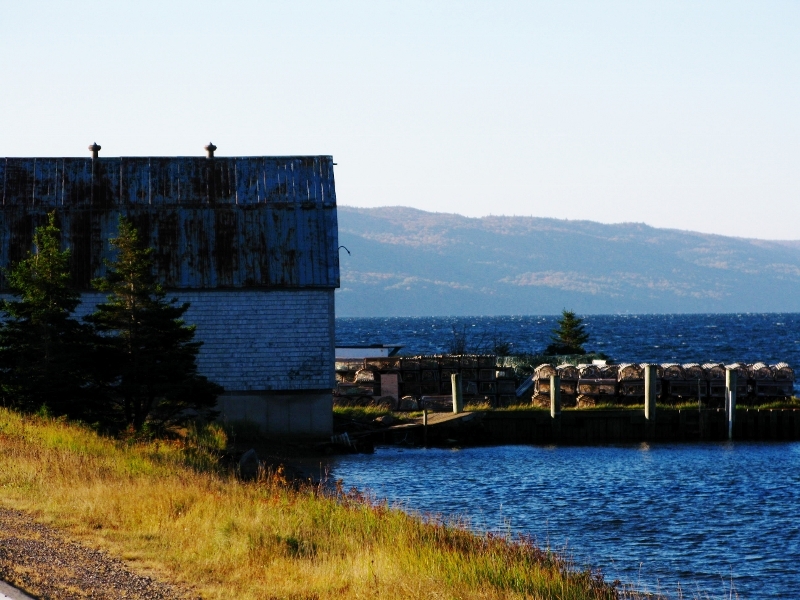 Linking Cape Breton to the mainland, it’s quite a testament to man’s building prowess. But as you cross it, and miss the turn you need, make an illegal left, and realise that in two days you’d hadn’t seen anything resembling a police car or a Mountie, you pass into another world. A more mystical one, more sublime. One of colour, romance, and … peace. 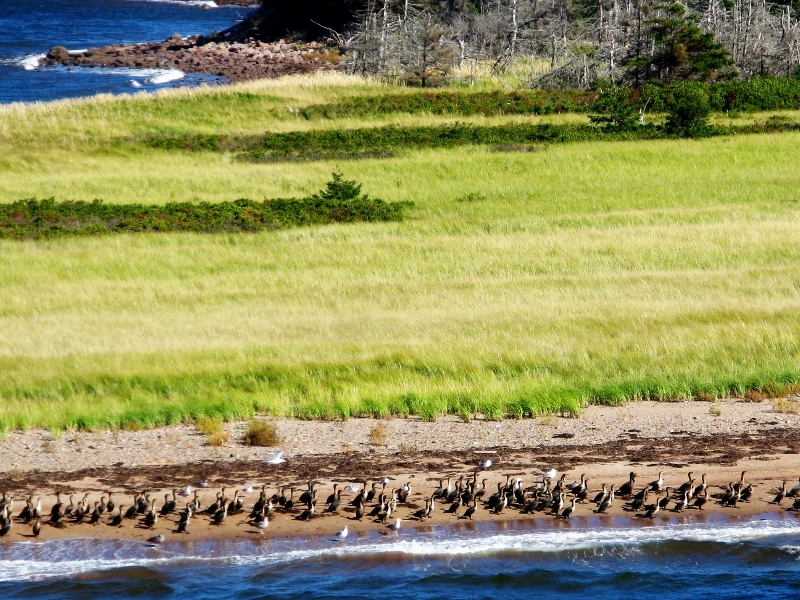 About 350 km after breakfast, we arrived at Margaree Harbour and the Duck Cove Inn just in time for dinner. Welcomed by name (cue theme music from Cheers! 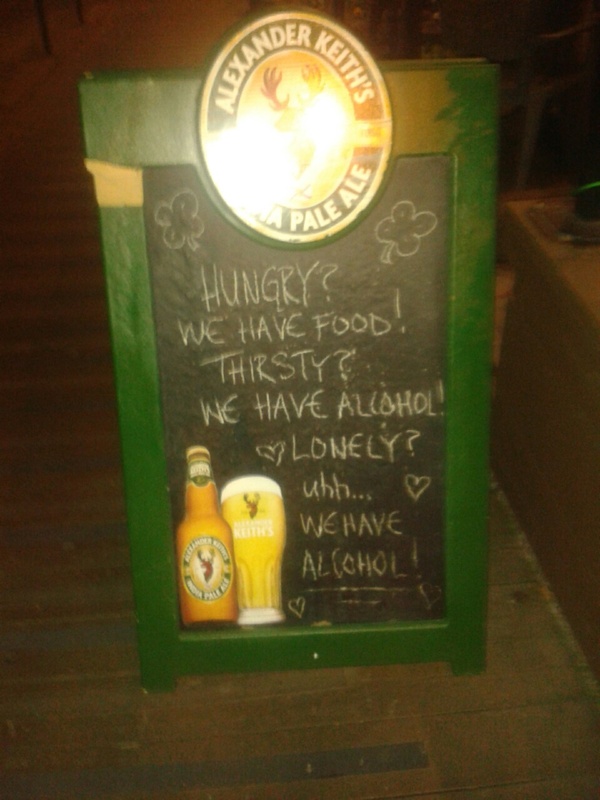 ), I was more than compensated for the fact that there was no bar and we had 30 minutes before the kitchen shut (it was just 7pm – things close early in this part of the world). Everything here works to its own time and once you accept the fact that no one is in a hurry to do anything and multi-tasking isn’t on the menu, then it’s lovely – truly lovely. Gordon, the owner/receptionist promised that next time I came, he’d rally all the Murphys in the area and we’d have a hooley. Apparently, I wasn’t the only one in the vicinity that night. If I were in the mood to relocate, or was even contemplating a life outside of Budapest, I may well have found my city. In the past few years, when I travel, I have found myself looking at a city’s livability… would I move there? I first noticed it in Riga (possibly) and Geneva (no). Perhaps it’s a testament to how much I love living in Budapest that nowhere has gotten an affirmative thumbs up. Until now. Until Halifax. I know little of the city – we landed downtown at the hotel about 7 pm and left the following day around 1pm. Not a huge amount of time on which to base a potentially life-changing decision, admittedly, but I’ve made life-changing decisions overnight before and have no regrets. I’m all for that ’empty-handed leap into the void’, for it is often in that void that true potential is realised. árom – except for it is round and this was star-shaped; and it is much bigger; and it has an indoor railroad. Apart from that though, they’re quite similar. 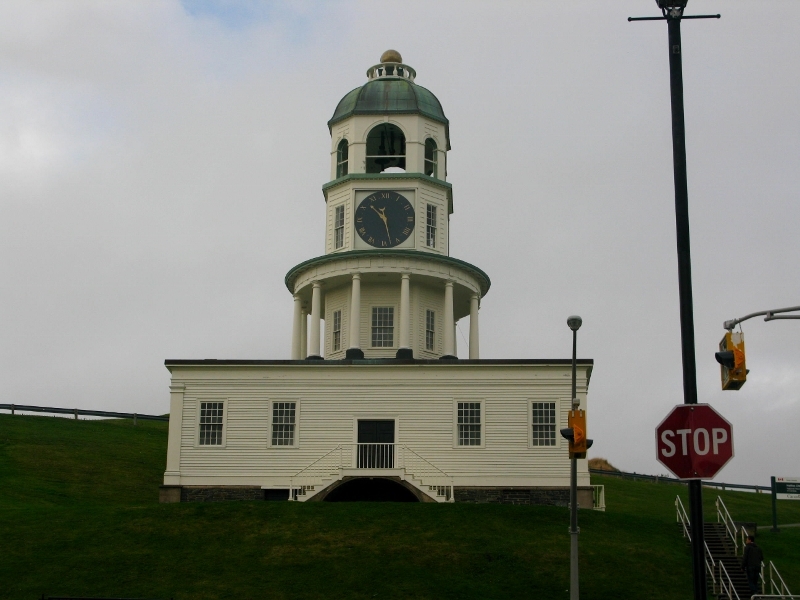 This is the fourth (I think) to be built in Halifax and interestingly, though build to defend the city, it has never seen battle. It took all of 26 years to complete (compared to the six envisaged) and today provides employment for some keen young people who don’t mind having their photos taken by a regiment of random strangers. Personally, I can’t think of anything worse – but every crumb to its cookie. You can actually enlist to be a ‘soldier’ for a day and get your own uniform. As I said – cooks and crumbs. 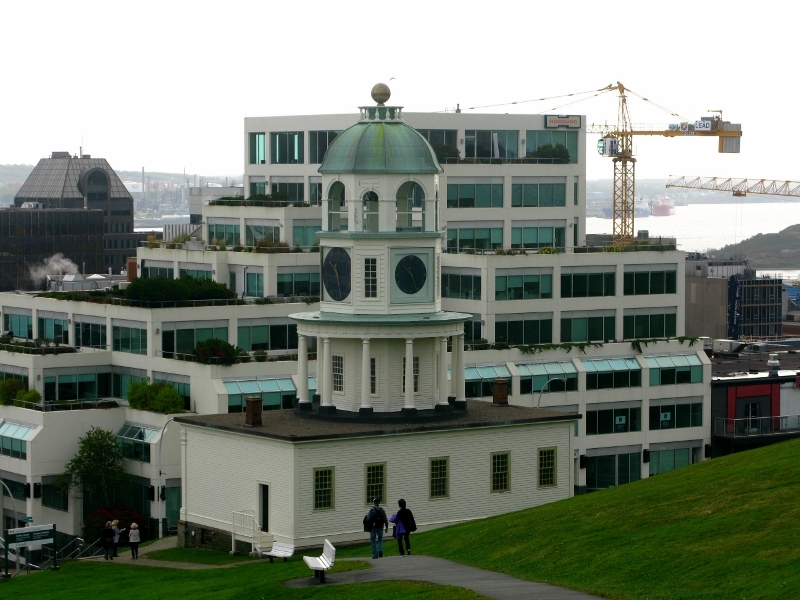 Just below the Citadel is the famous clock tower, supposedly commissioned by Prince Edward back in 1803 to help cure the garrison of its lack of punctuality. It’s been keeping time ever since. Trivia question: did you ever notice that most clocks with Roman numerals use IIII for four and not IV? I certainly hadn’t… but apparently that’s the case. What struck me though was when viewed face on, it looks rather sweet. And when viewed from the citadel itself, it seems to be struggling a little to hold its own. Perhaps I was letting my imagination run away with me and empathising a little too much with something that seemed a tad out of sync with the world around it. The waterfront is slightly twee but still lovely. It’s off-season and what few tourists were around far outnumbered the shops and restaurants that were actually open. It would seem that during the week there’s not a lot going on in city but yet it has a wonderfully warm feel to it. There seems to be unlimited potential bubbling away just waiting to be discovered. It’s avidly anti-smoking, with smoking banned even on outside terraces. I think I saw three people smoking in the whole time we were there. 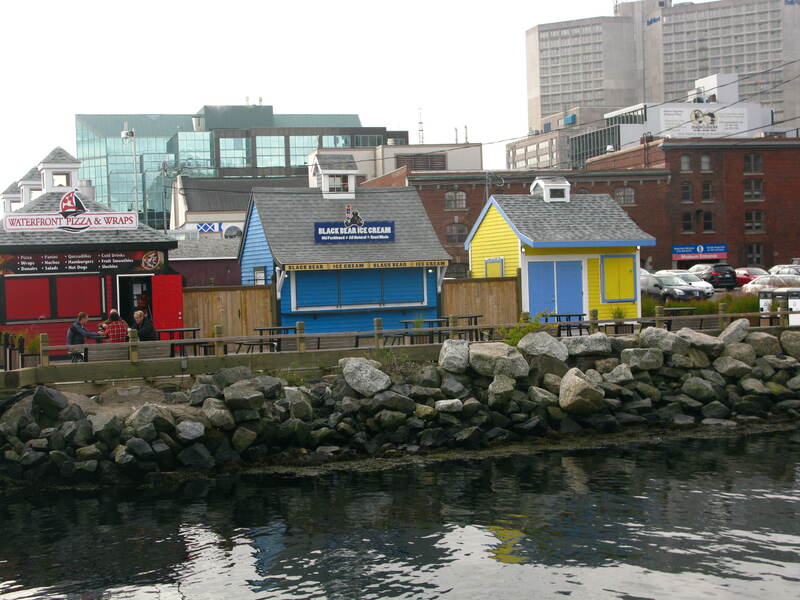 But back to the waterfont, and Pier 21, where more than one million immigrants disembarked for a new life in Canada. 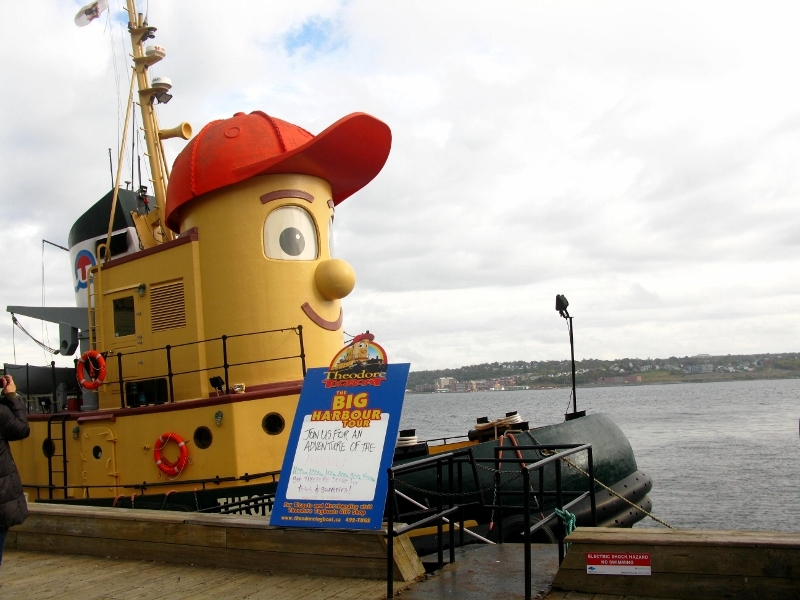 It has the oldest continuously operating farmers market in North America, and a host of maritime exhibitions involving boats from WWII, schooners, and all sorts. I can only imagine how thronged it gets in the summer months – and I can well imagine being a regular down there for a morning coffee. 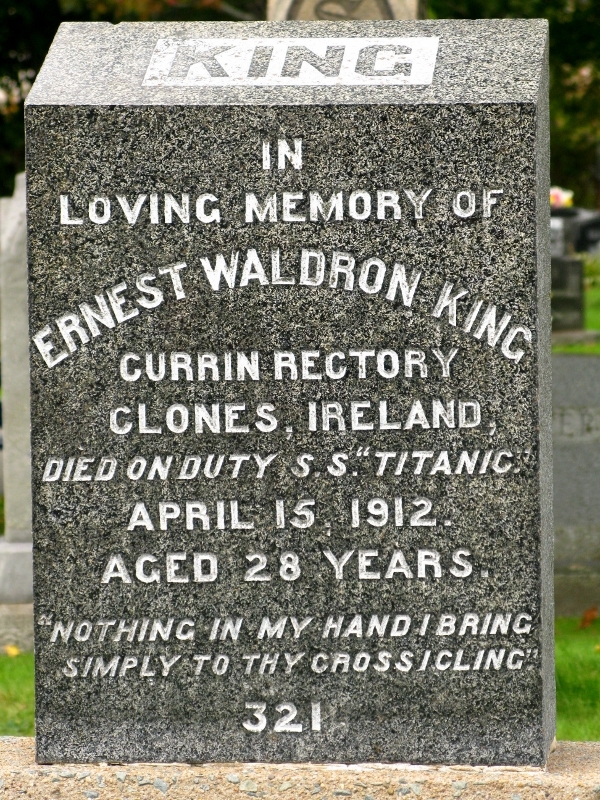 Next up was the cemetery – the one where 150 of those who died on the Titanic are buried. Surprisingly, I had to ask five people before one could tell me where it was, and he had to Google it. What was interesting is that many were buried and then later identified, their names added to their tombstones after the fact. And many more are still known by their numbers rather than their names. I find that incredibly sad. How ever anonymous we might be in life, we should at least be named at our death. I was struck, too, by the marker of a man from Clones, in Ireland. Of course there were plenty of Irish aboard, but what got me thinking was the idea of a priest (or vicar, as it’s a rectory) being on duty – and ergo, off duty. I’d somehow thought of religious life as a 24/7 calling rather than a profession. We did get a little lost on our search for Fairview Cemetery. But that is only to be expected when I’m driving. The silver lining was that we got to see local neighbourhoods with their colourful wooden houses (does this style have an architectural label?). One in particular caught my eye, or rather the inscription beneath its window. Perhaps because it embodied what for me has become something I’ll forever associate with the city – its honesty and its openness. While I don’t think Budapest is in any danger of getting rid of me anytime soon, it’s good to know that there is somewhere I wouldn’t mind spending a couple of years. Definitely worth a visit. https://unpackingmybottomdrawer.com/wp-content/uploads/2017/06/logo-300x82.png 0 0 Mary Murphy https://unpackingmybottomdrawer.com/wp-content/uploads/2017/06/logo-300x82.png Mary Murphy2014-10-09 03:33:282016-08-10 11:39:24Moving cities?? ?